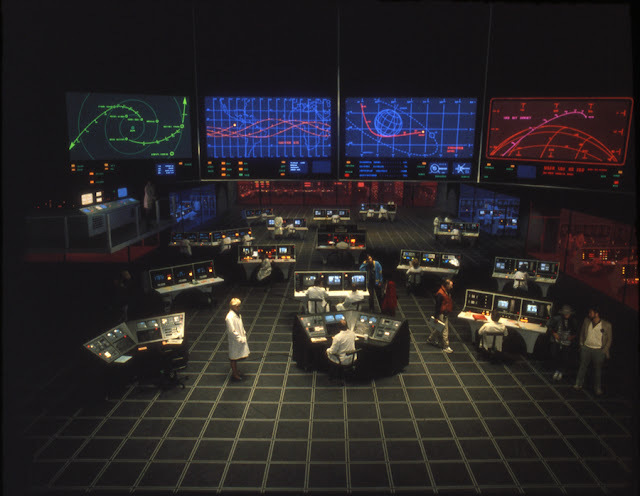 without a single cyber 'gremlin' in the works, it seems a new horizon might just be upon us after all! 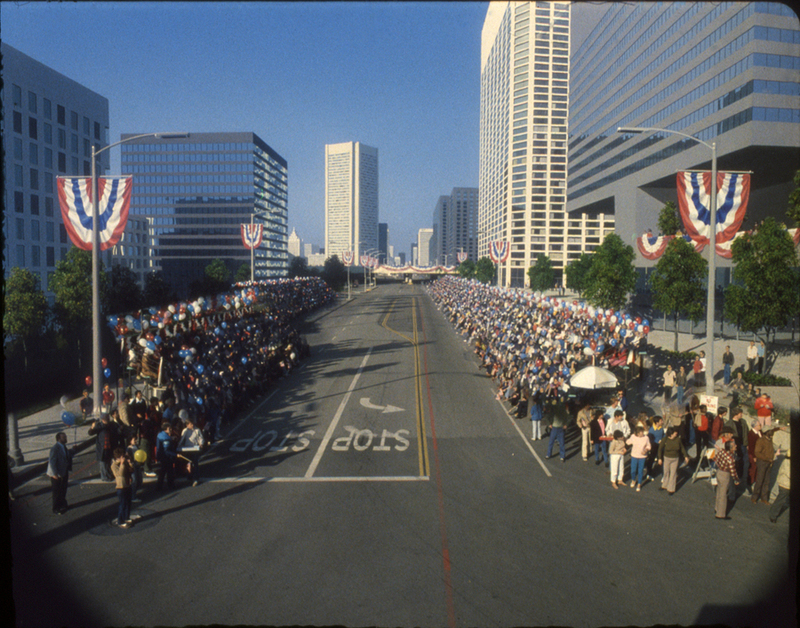 for by far the vast majority of their shots, as the many images below will easily testify. James Cameron feature film as well as Ken's brave aquatic voyages where few have ventured. I sincerely hope you enjoy today's blog... it really is something else! From December 1984 to March 1985 we did several matte shots for the 1985 film MOVING VIOLATIONS. Among those, two views of "Dana's Nursery" were needed one day and one night. Here's my small proposal concept for the day scene, simply done in black and white. 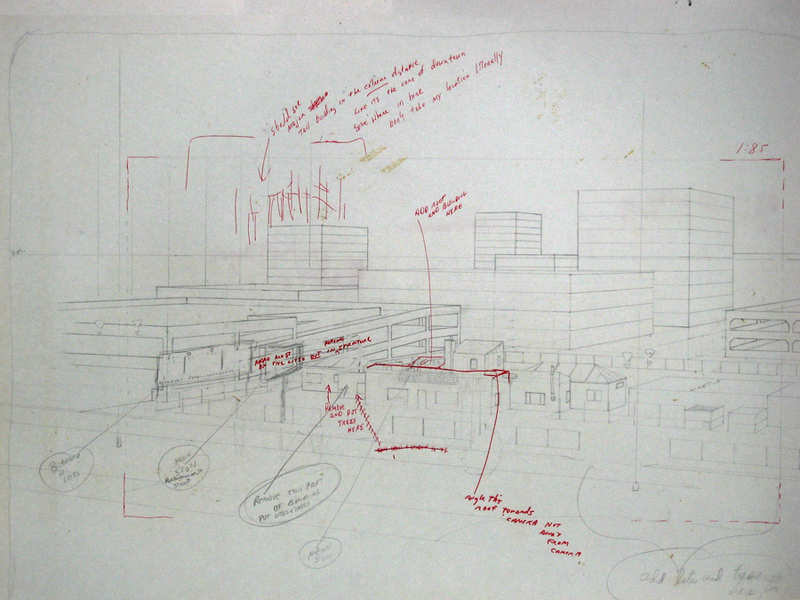 Usually my matte concepts were approved from very simple renderings like this or even quick sketches. The original photography, or plate, before the matte was applied. The location is El Segundo, California, looking west (Sepulveda Boulevard crossing the frame in the foreground). 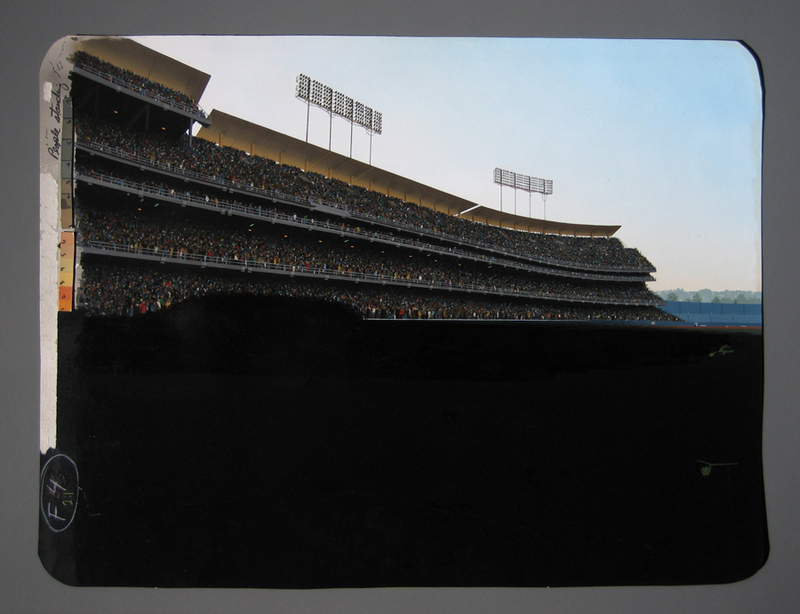 The plate masked off, the matte painting and finally the finished composite. Close view with my hand giving a sense of scale against the artwork. Another of the several mattes for MOVING VIOLATIONS. seen overhead. 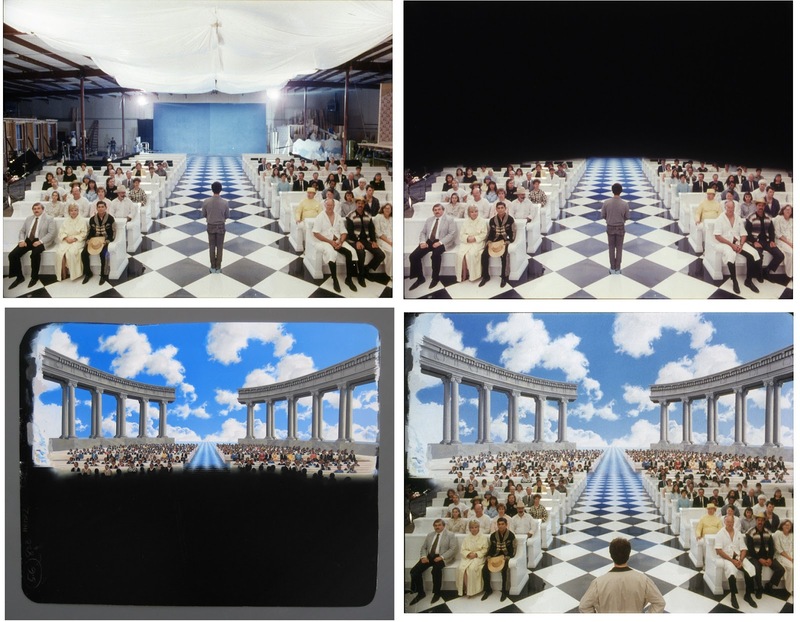 I honestly don't recall if it was shot on a stage or at a real technical facility. 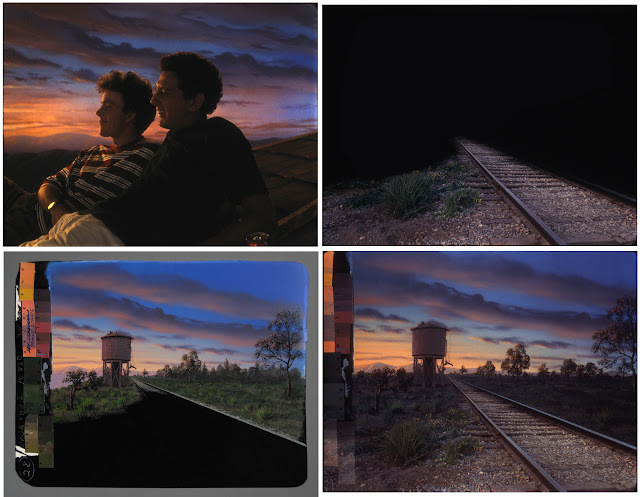 screens and details, filmed in two separate double-exposed passes. behind with various colored gels. 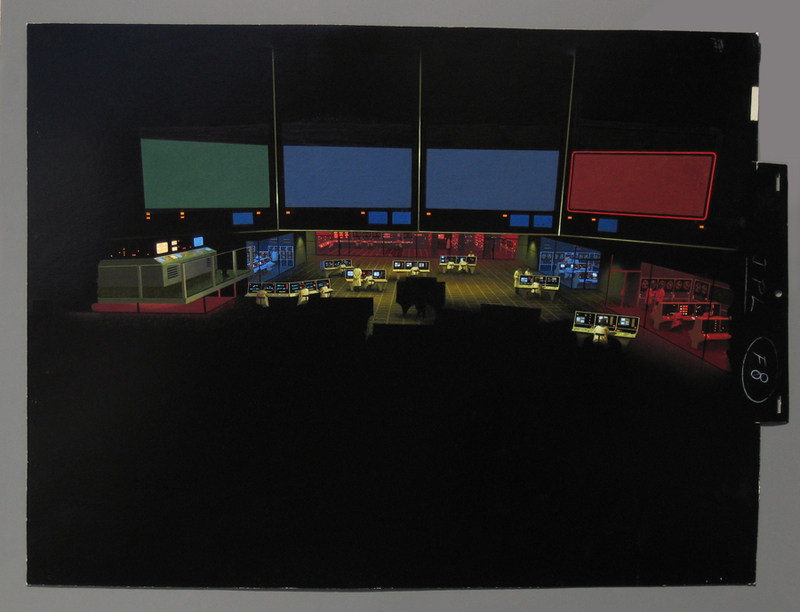 Here's one of the finished cards used for the backlight passes. This one could be called the "background" pass. 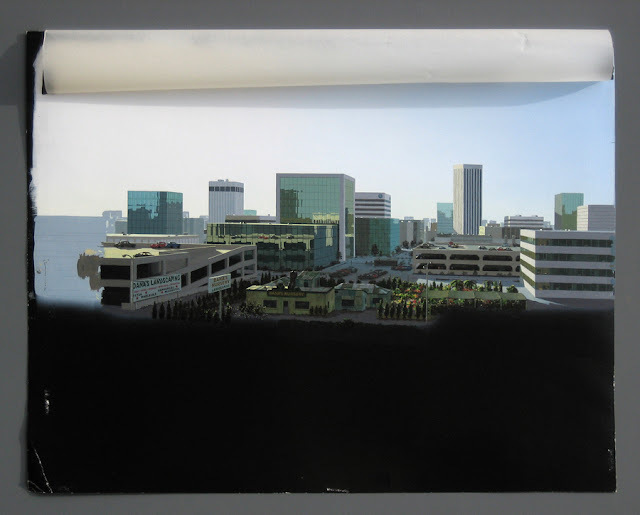 This is the second backlight art with details that laid over the earlier backlight art, in contrasting colors. 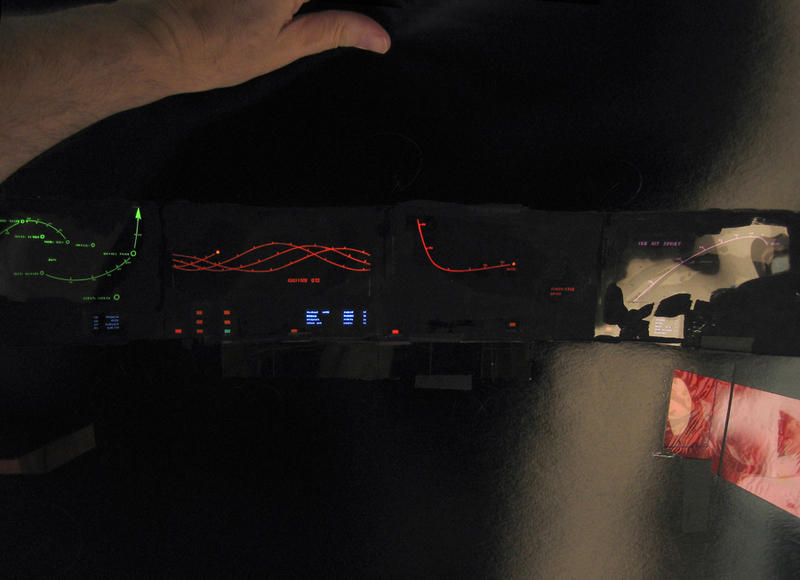 A rear view of one of the backlight cards showing various colored gels taped in place. 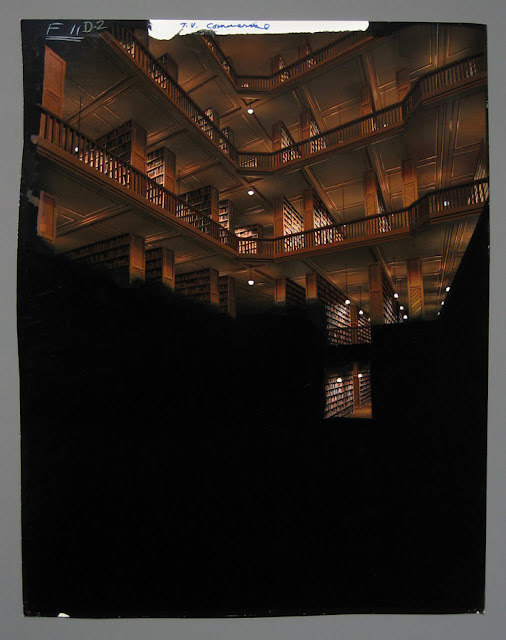 Finished composite, dated Feb. 18, 1985. 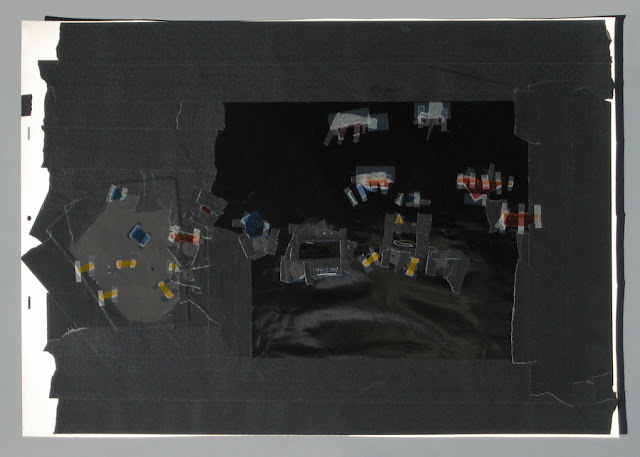 The matte in place (black camera tape applied to the glass on the matte box in front of the camera lens). 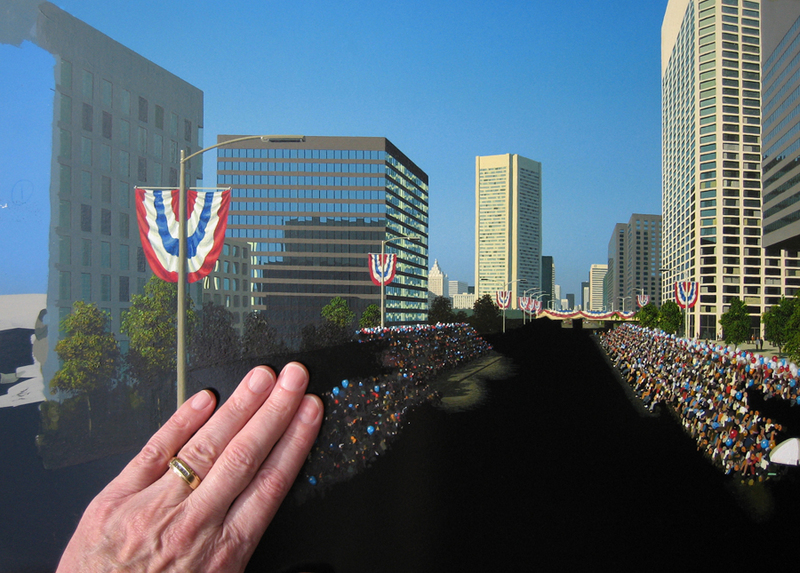 Here I'm touching the painting to show the scale of it. 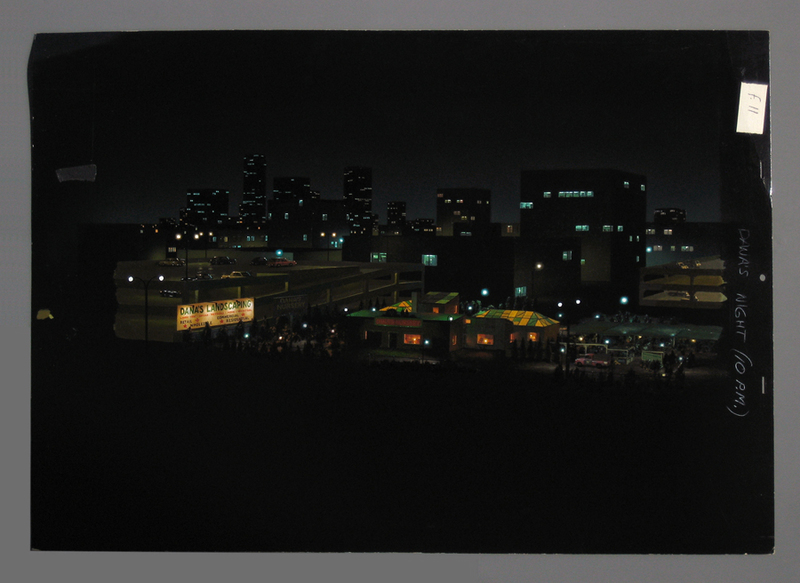 Finished composite, dated Feb. 28, 1985. Parade floats come tearing around a corner in the far distance and rush toward us, then around the foreground corner, heading off to the right. This overlay shows where the "animated" people are, double exposed over the painting in a separate pass through the matte camera. 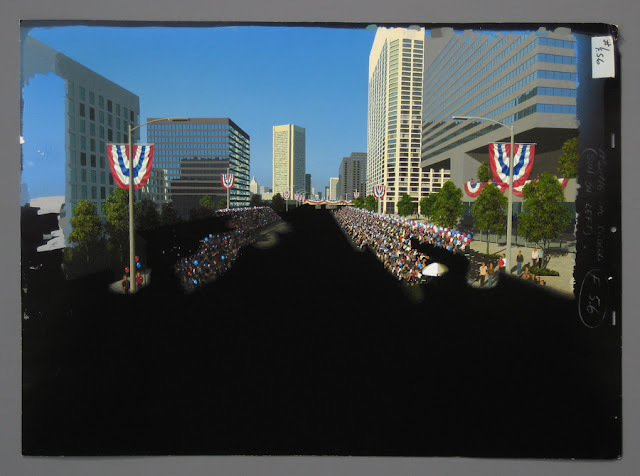 Close-up of the "animated" people -- a bunch of "holes" in an opaque black card with colored gels taped behind them and made to undulate in brightness through the use of a moire behind the card. 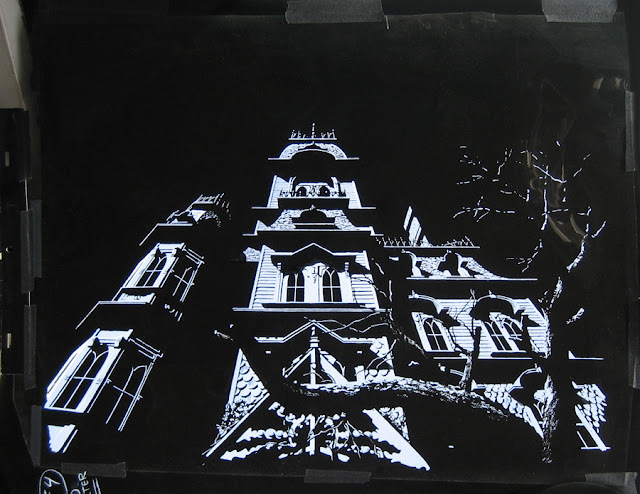 The "holes" were made by painting black Cel-Vinyl onto Mylar, then scraping away the spots with a pointed instrument. 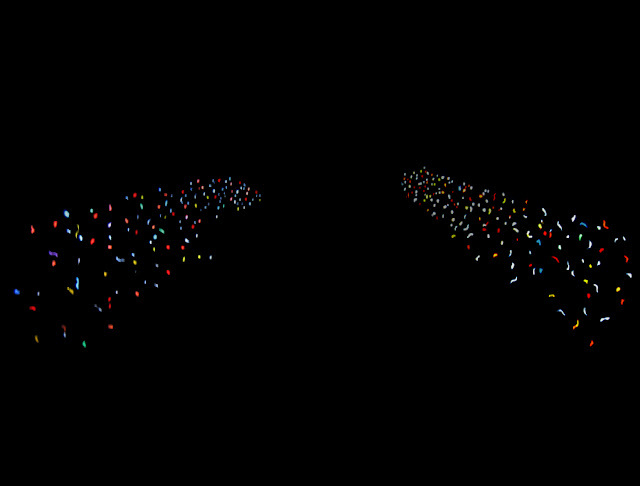 The resulting effect gives the look of an animated crowd. 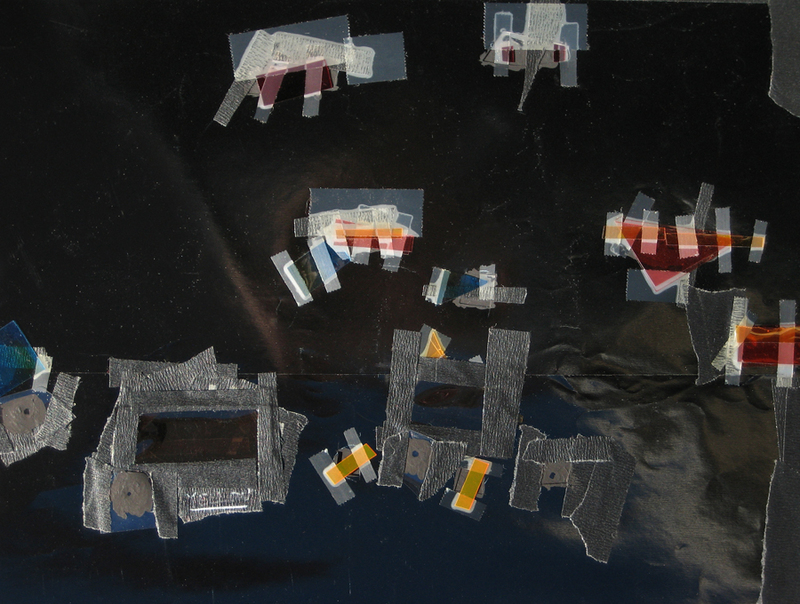 The backside of the "animation card" showing all the little pieces of colored gels taped in place. 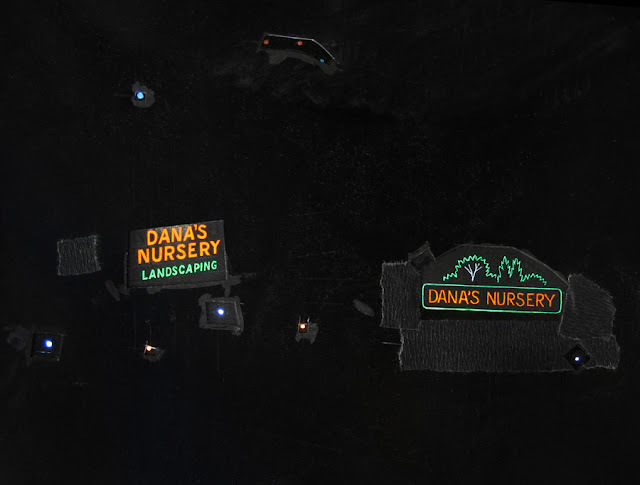 Dana's Nursery at night from the film MOVING VIOLATIONS, here as original unmatted view. 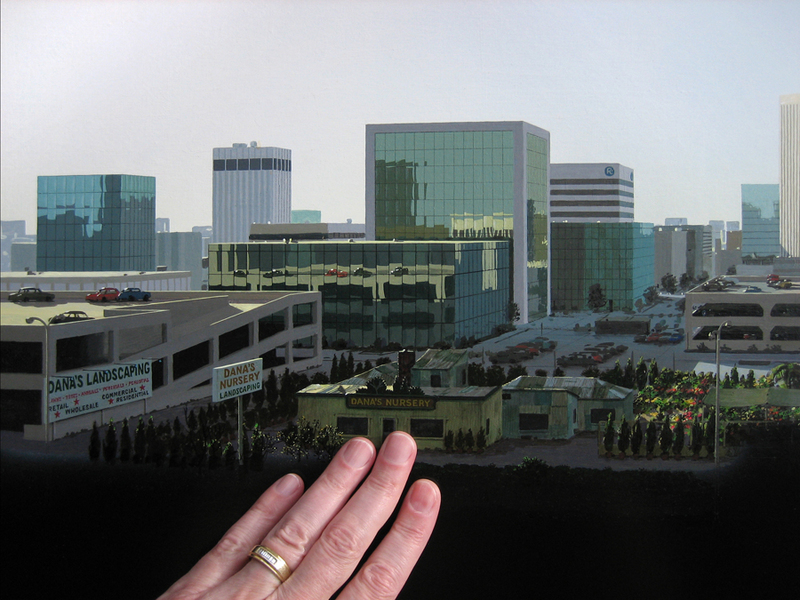 Rotoscope on the back of the painting, giving me perspectives, from which I laid out my new buildings. Bruce has added notes. 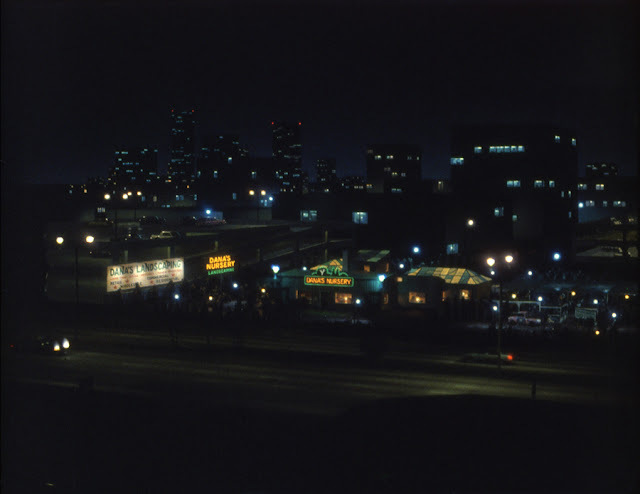 The finished composite, dated March 22, 1985, including backlit neon and other light elements burned in on a separate pass. 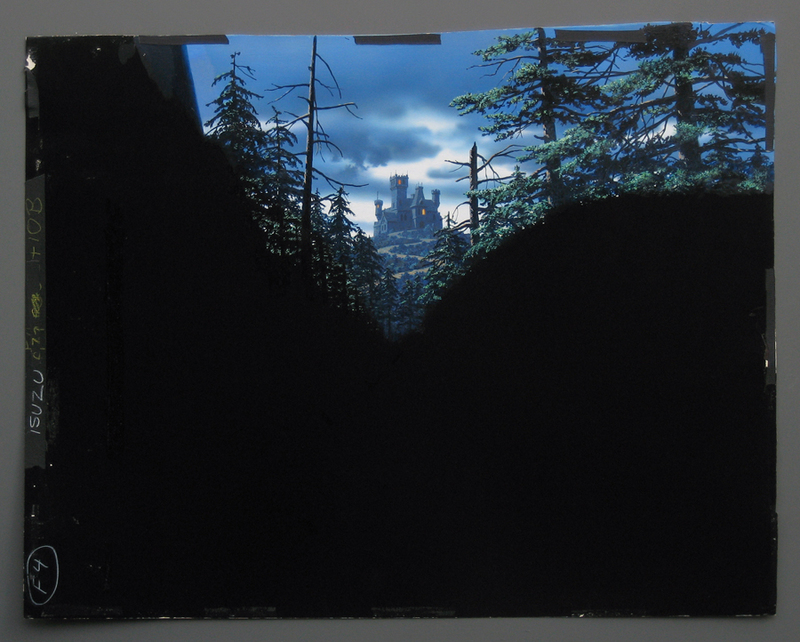 Close-up showing some of the artwork for the backlight pass (details scraped into black Cel-Vinyl and gelled from behind). Back side of the nighttime lights burn-in artwork showing the various colored gels taped in place. original location photography, the matte in place, the painting as well as the final composite. I don't recall any action in the scene, which if true would be a waste, of course. 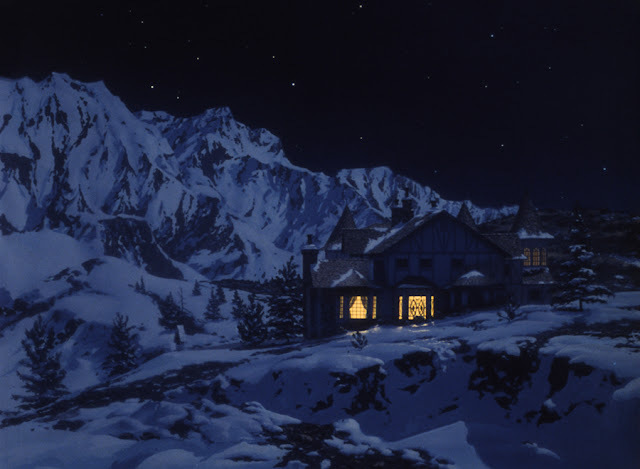 Here's the same scene timed much darker and with a separate backlight pass to burn in the house lights and stars. in front of Fantasy II, masked off. The lower left image shows a test where the painting is nearly complete. 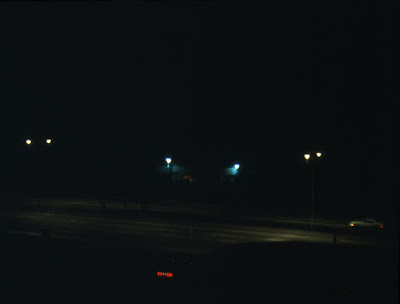 I believe the optical guys at Fantasy II added some smoke to the chimneys. Lower right, the painting. 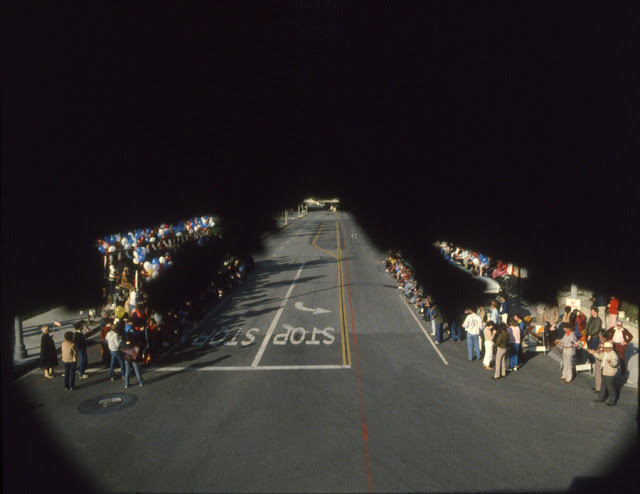 dark line drawn above the color guard in the background. tried to "fudge them out." 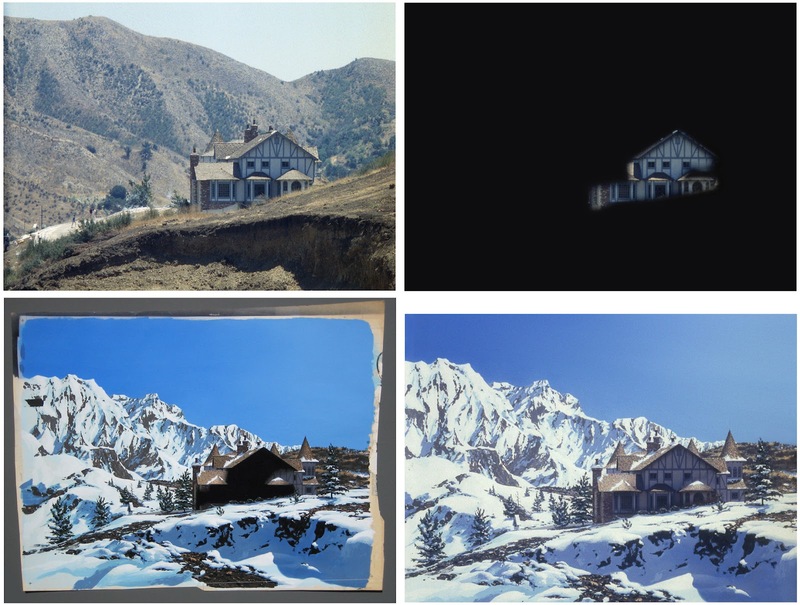 The painting and the final comp are also shown. 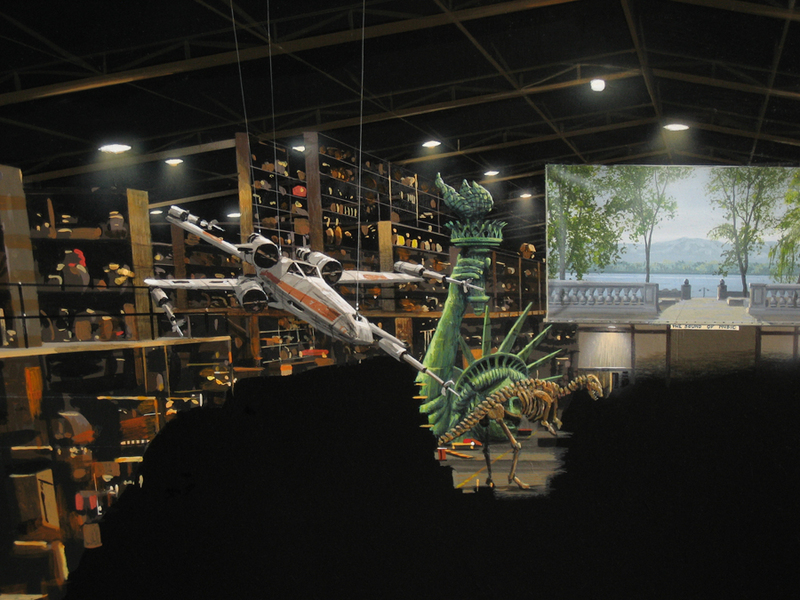 encroaching film equipment can be seen at right..
removed before the final production footage was shot. 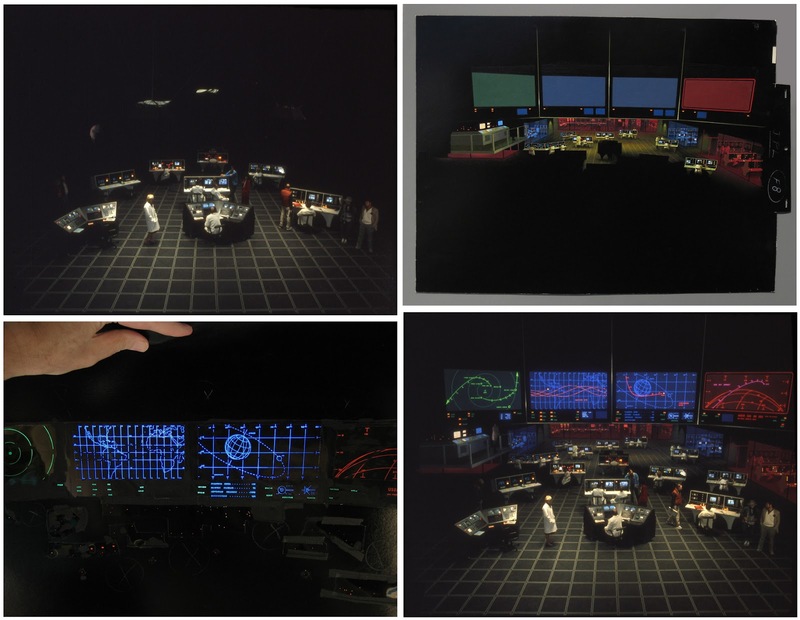 This set shown at top left, was built inside a sound stage at Paramount, if I remember, for a short demonstration film on how sound is created, to be part of the Disney-MGM Studios tour in Florida. 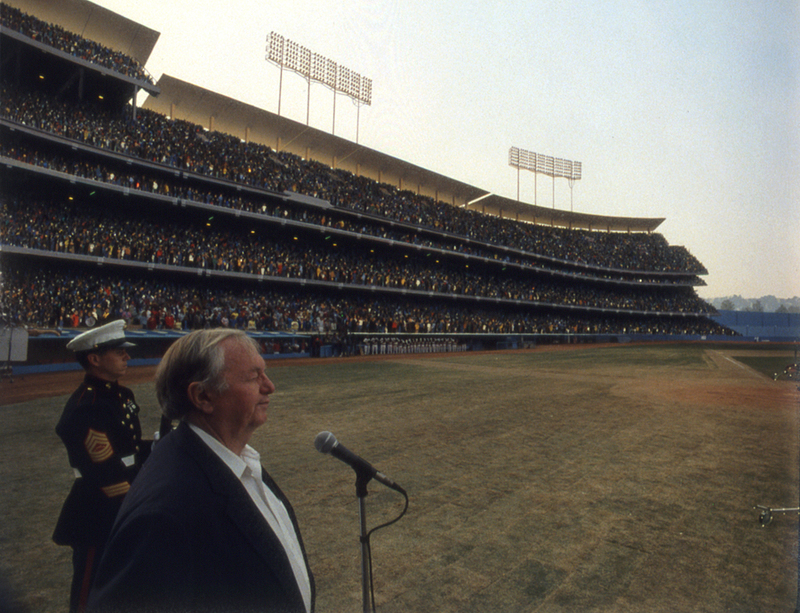 I took the photo in October of 1988. At that time the working title of the film was MR. LUCKY. 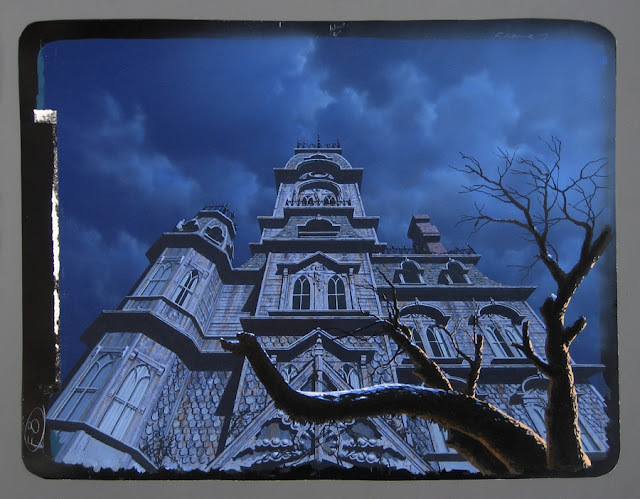 My task was to paint the upper part of the Victorian "haunted house" for an up-angle shot and add lightning effects. 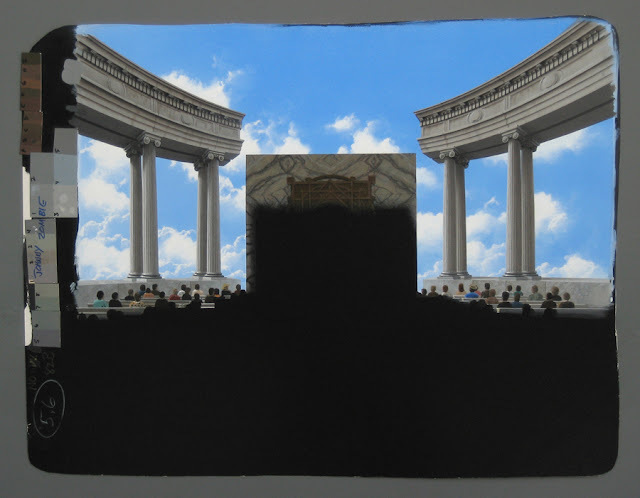 Shown here too are my first and second conceptual renderings. The drawing was finalized on tracing paper, and then graphite was rubbed on the backside for tracing onto the white side of a sheet of our matte-painting card stock through the dry-transfer process. 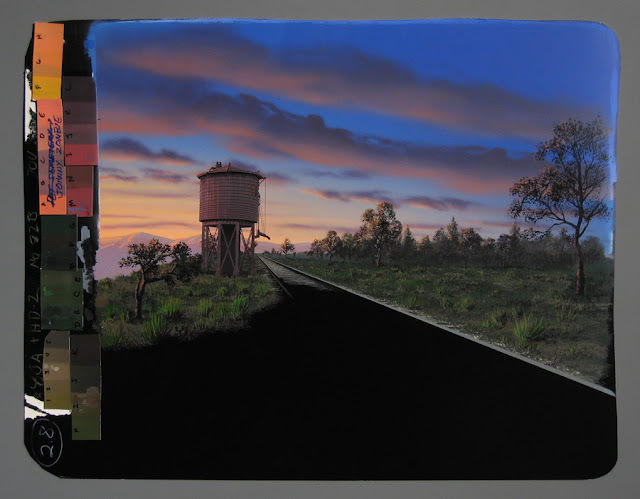 A film test showing the painting in progress, perhaps for a lightning test. The final painting is seen at top right. The artwork for the house illuminated by the lightning and then double-exposed on a separate pass through the matte camera. The clouds, illuminated by lightning somewhere behind the house, also filmed as a double exposure on yet a third pass. Finally, pouring rain was added optically.. 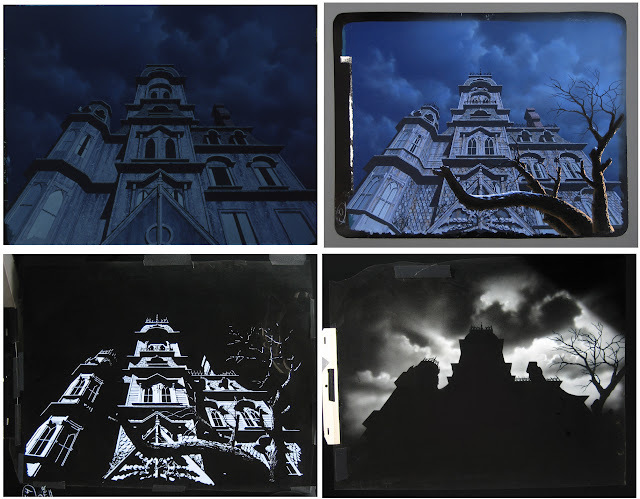 The artwork for the house illuminated by the lightning was done on Mylar while simply laid over the background painting of the house and then double-exposed on a separate pass through the matte camera. 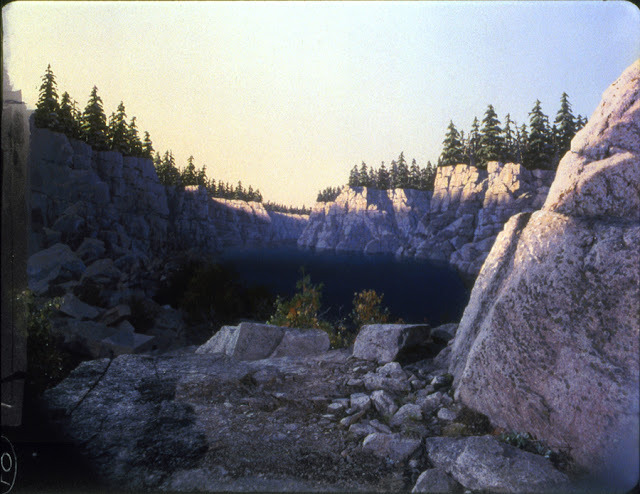 photographic print of the location. 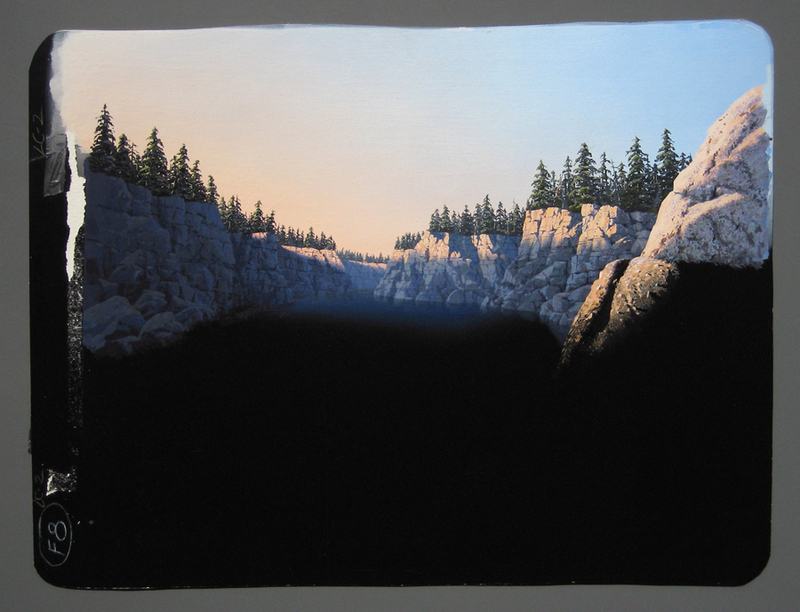 Only the foreground rocks are real. 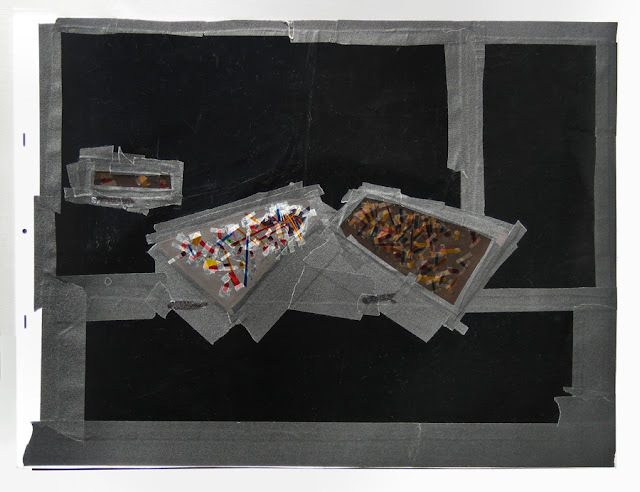 The proposal with notes by the art director written on a Mylar overlay.. Original photography before matte was added. composite, completed May 25, 1989. 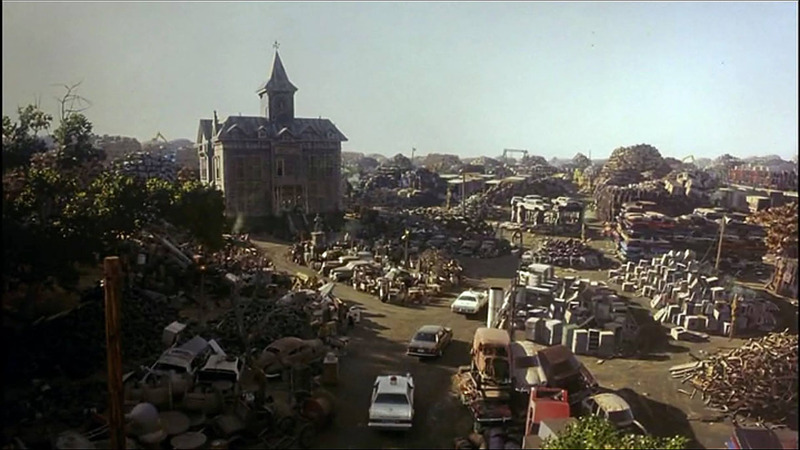 I don't remember what "live action"
moving, or again, it's an awful waste of a matte shot. *Pete here; I don't recall there being any movement or 'live' action. 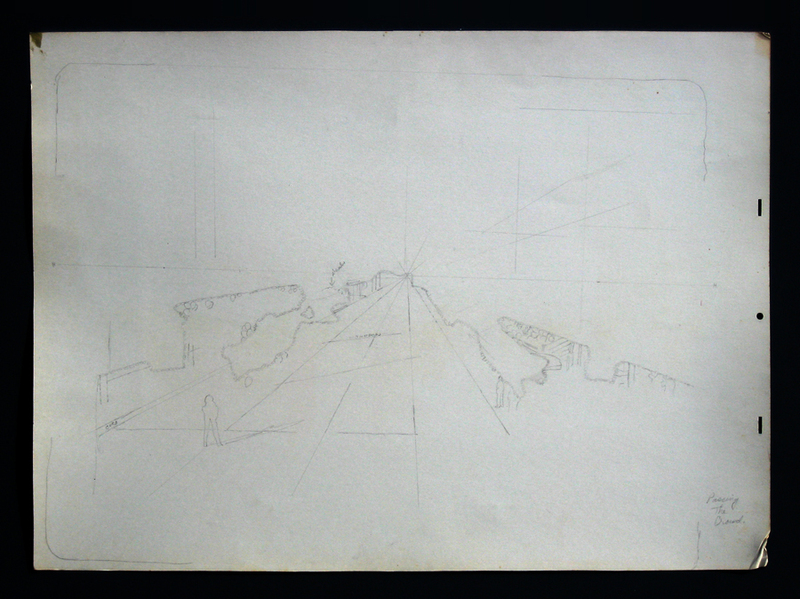 very rough sketch of what he wanted, to be delivered to the "mat"
few windows had been added in with "White Out." As the painting and testing progressed I noted several corrections given to me over the phone.. 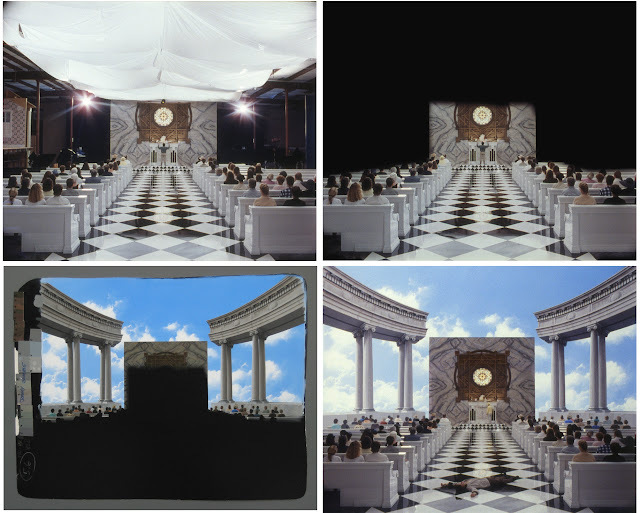 Final composite, completed Feb. 1989.
could see how it turned out. the director had in mind. it anywhere. I have no clip showing the final composite. painting, as was our usual practice. 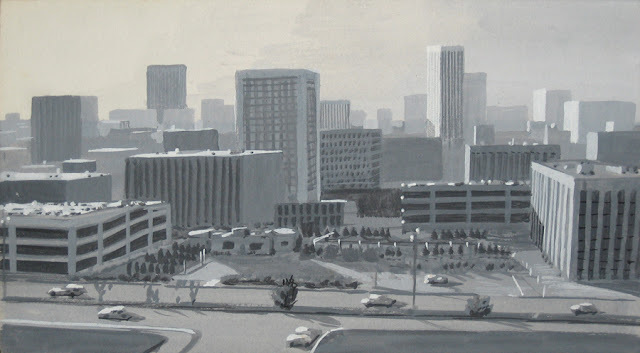 Here too is the finished painting. Close-up of part of the ShoWest painting, as rendered in 1990. 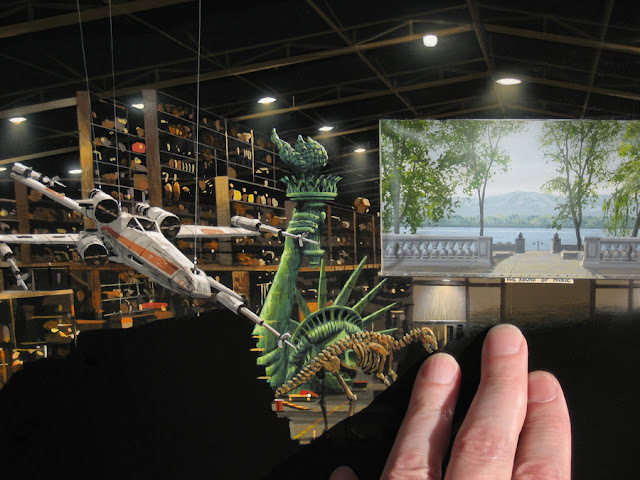 Showing the scale of the ShoWest artwork. matte shots showing a "Heavenly judgement," a courtroom in the sky. was added, the matte, painting and final comp, dated Spring 1993. The other matte shot from MY BOYFRIEND'S BACK, reverse angle, without matte. top of the tower. At top left is the scene I was supposed to match to. 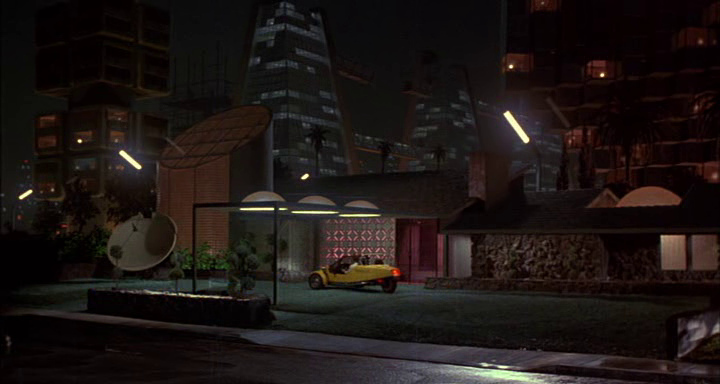 I have no film clip showing the original location without the matte, but here's the matte in place. 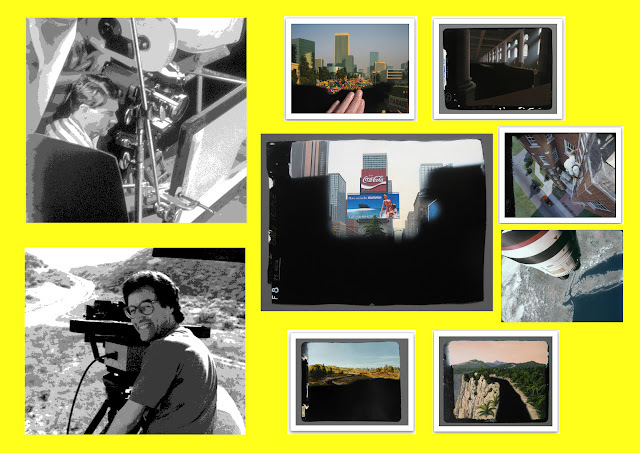 artist and effects man) in the mid 90’s. day, and L.A. was on fire. Illustrated History for which I had recently done a lot of paintings. with the author, Don Lynch, and me as soon as possible. 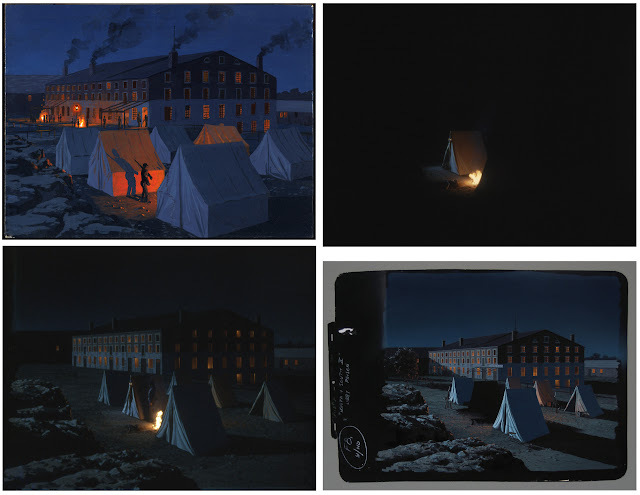 corresponding scenes from the film. Don and I were each given a copy of his “scriptment” to read, and other meetings followed. 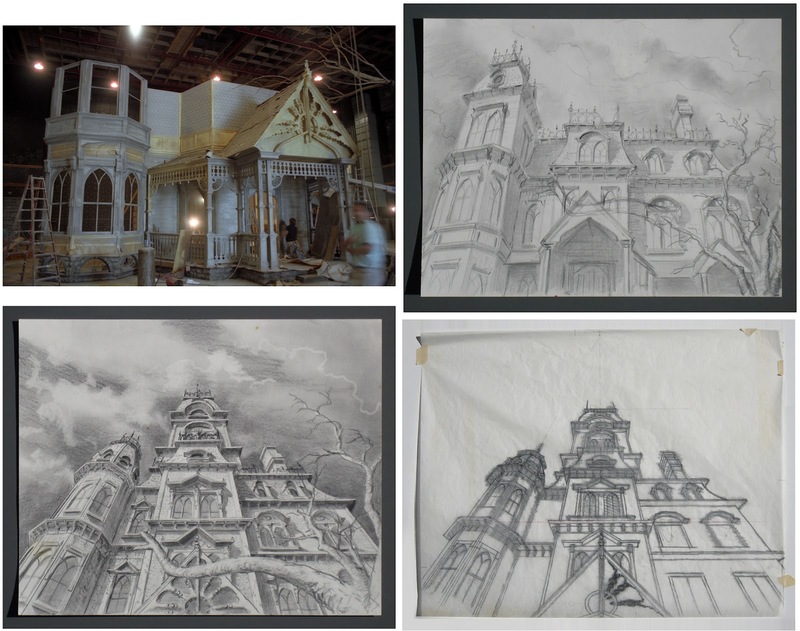 I was hired on to assist the art department with research and set design, opening my archives and providing reference material to enable the sets to be as accurate as possible, something that was a high priority from the outset. Many other films had been made on the subject through the decades, but all had cut corners in the accuracy department, some to an inexcusable extent. Jim, as Cameron preferred to be called, wanted none of that. “If there’s any way we can do it, that’s what I want to do. This has to be right.” At times I kind of thought I’d died and gone to Heaven. We were well into set design when the project was finally greenlighted by Fox. I guess it took a while to work out some kinks, but with Jim’s successful history with Fox I don’t think it was ever in serious doubt that we would get the go-ahead. It was many weeks into my employment there when, one day, Jim suddenly appeared in a doorway looking at me quizzically. Pointing to me, as I recall, he said slowly and in a slightly unsure tone, “You painted the matte for the final scene in TERMINATOR.” The jig was up. He remembered me. “Guilty,” I responded, sheepishly. Doing all those tests and making changes to that matte had been a headache for both of us, and I had feared that he held it against me all this time. But he assured me that he harbored no hard feelings whatsoever, and I had worried for naught. Following several months at Lightstorm, after the sets had largely been drafted, I transferred over to a huge old airplane hangar at the former Hughes Aircraft facility in Playa Vista where Digital Domain was busy getting ready to start on the miniatures. 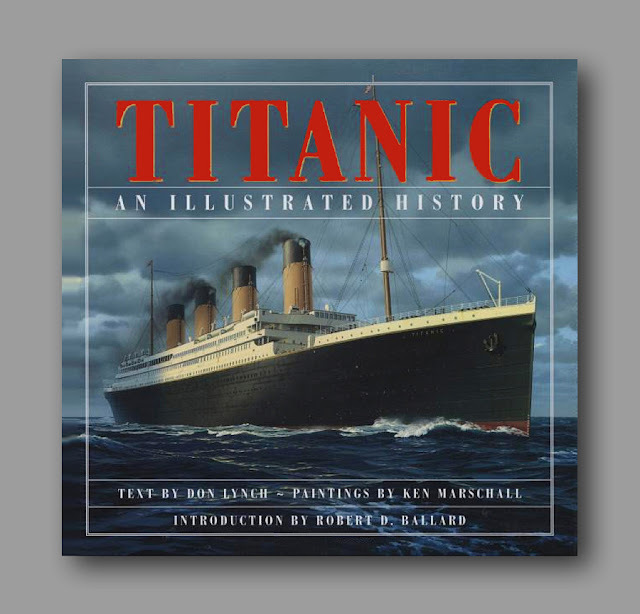 There, as I had done on RAISE THE TITANIC almost two decades earlier, I circulated among the crew, trying to make sure that they had all the reference material they needed at their fingertips and that any questions were quickly answered. With several Titanic miniatures being built in varying scales, two Southampton tugs, a Cherbourg ferry named Nomadic, and a bunch of interiors, it was a daunting task for one man who simply couldn’t be standing at everyone’s side at once. But despite a few flubs, inevitable with such a gargantuan project, amazing results were achieved. 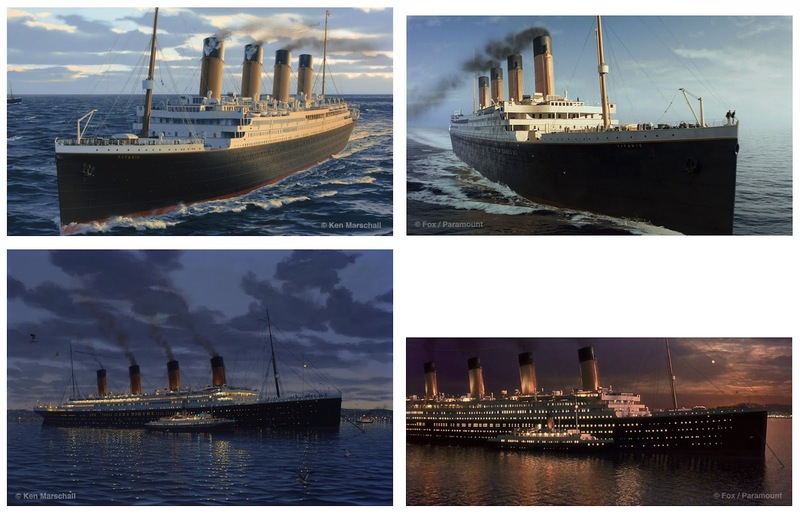 The largest of the miniatures was the 1/20th-scale (44-foot / 13.5-meter) model of the whole Titanic, while parts of the ship were modeled in various larger scales. They were immense and breathtaking to behold, every rivet meticulously applied. 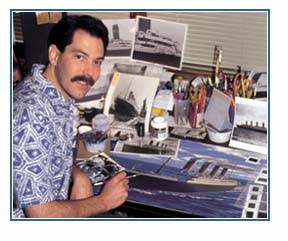 Posing next to various miniatures built by Digital Domain for TITANIC. Then it was down to the just-completed Fox Studios Baja, a few miles south of Rosarito, Mexico, about a 3 1/2-hour drive from my home in Southern California, where the numerous virtually full-sized sets were already under construction. At that point the crew was like a small army, the sets had long since been designed up north, so there was little I could do but watch history slowly rise and reappear before my eyes. I don’t even know how many times I went down there between October ’96 and March ’97 when the final sinking scenes were filmed. I visited maybe every two weeks or so, on average. 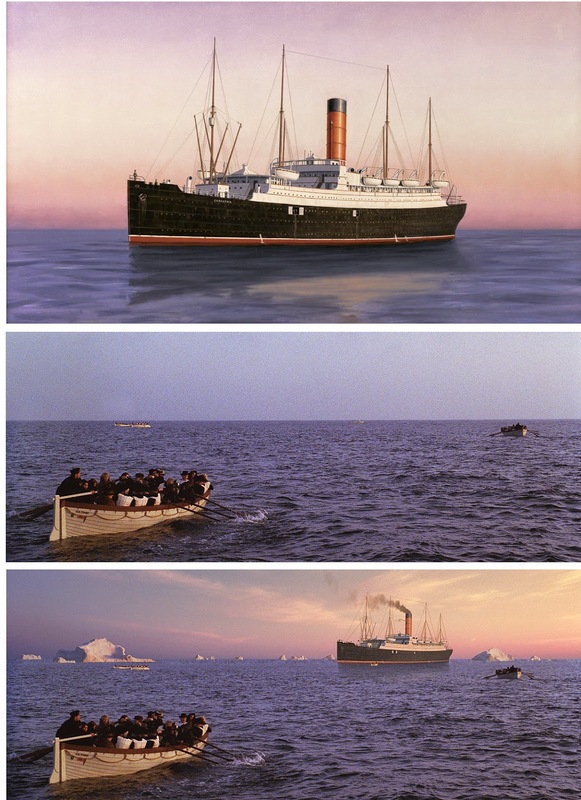 I could bring a few others with me, but often when people, even longtime Titanic buffs, heard that the studio was about 40 minutes south of the border, they balked. I tried to persuade several that if they didn’t experience these sets they’d regret it the rest of their lives. I would tell them, “Think TEN COMMANDMENTS meets TITANIC,” but sometimes it was to no avail. Mexico is a third-world country or, according to some, a “developing country;” parts of it can be dangerous, particularly Tijuana at that time, and the route took us briefly through that city. filming. The group photo was taken by staff photographer Merie W.
traditionally painted, though digitally completed matte shot for the final act of the epic film. 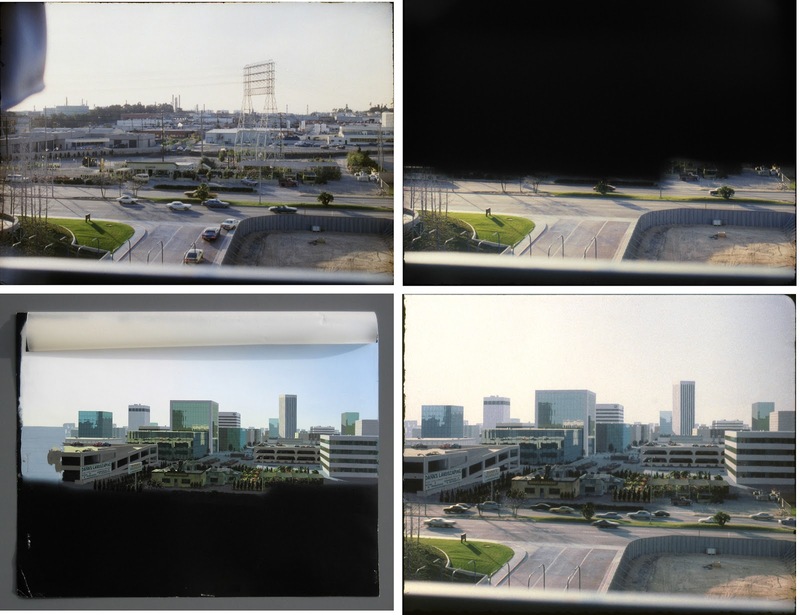 To this day I’m not really all that clear on what matte paintings were done for the film. 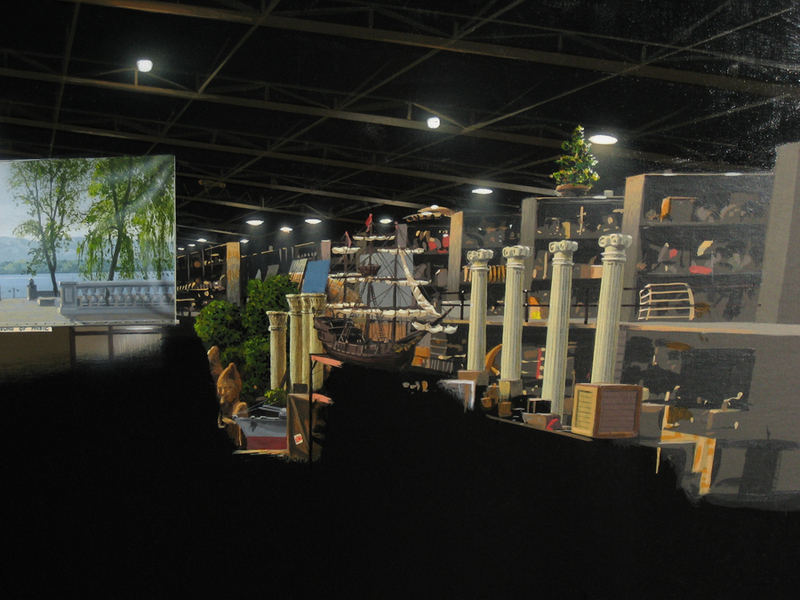 I don’t think too many, mostly patch jobs, I think –– fixing/blending seams between live action, sets and miniatures. 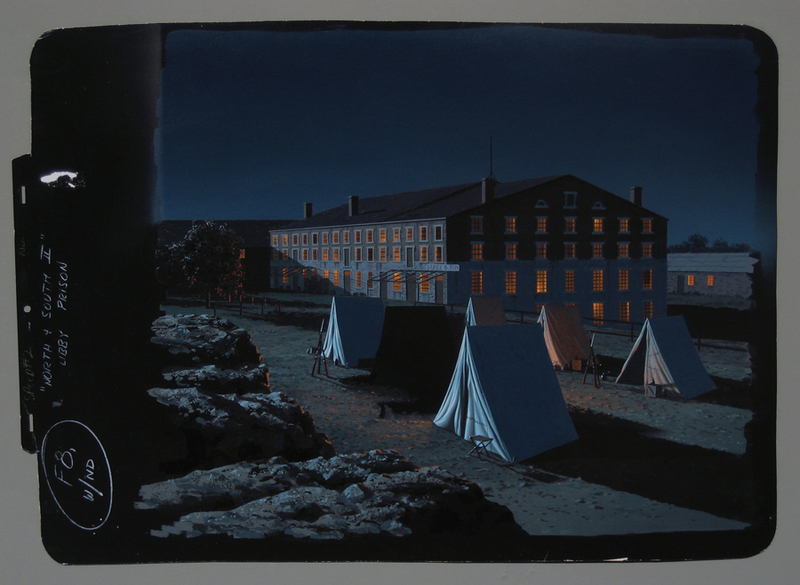 There were several painted backgrounds portraying Southampton during the ship’s departure and one showing the rescue ship Carpathia, but I can’t really think of too many others. I was never a serious candidate for doing any matte work, having my hands full with the other tasks. Jim did kindly set me up with an in-depth tour of Digital Domain which was slated to do mattes for the film, and I spent a few hours watching a guy work at his station as he explained his process, but it never developed into anything. I dropped the ball. 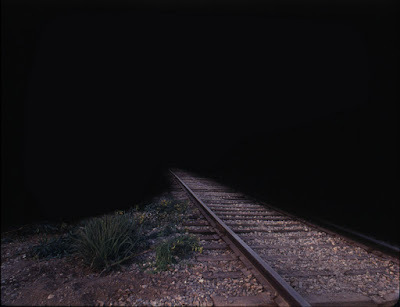 It was all too technical and scary to me. 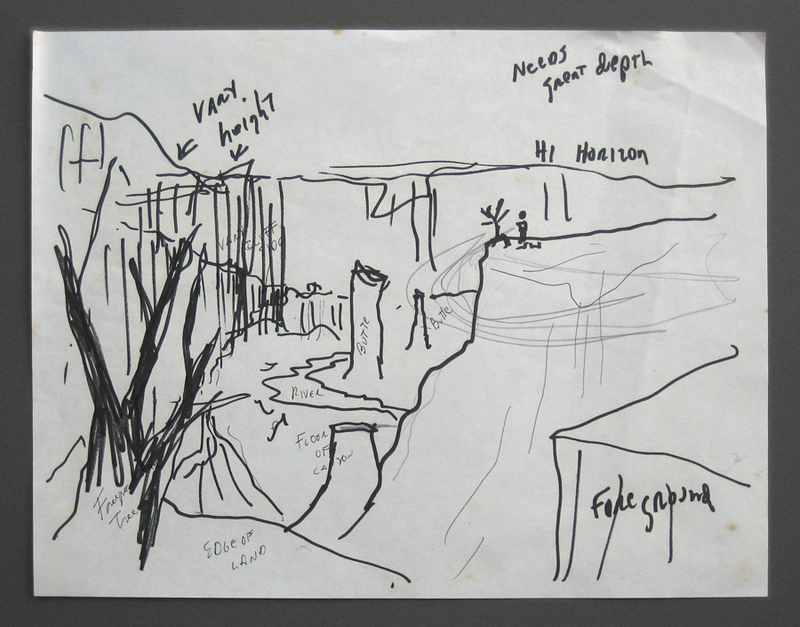 My artwork does appear in the movie, though. The large painting that hangs over the first-class smoking room fireplace is a copy of the original, titled Plymouth Harbor, painted in oil by the legendary British artist Norman Wilkinson. 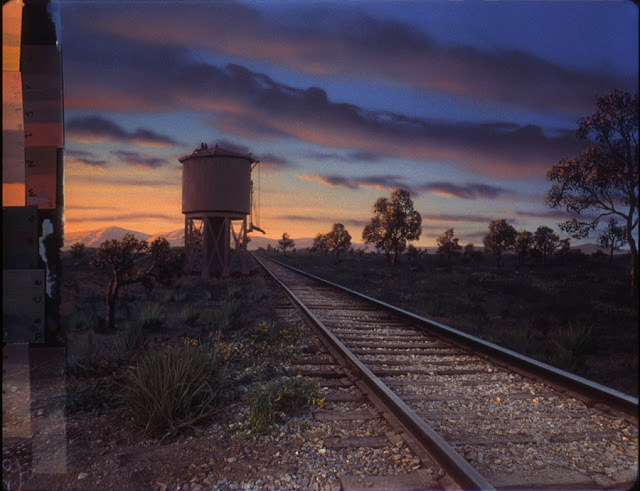 No photograph of the original painting was known to historians when the film was first being planned, and we knew we’d have to concoct some imaginary composition. Just as the art department was about to face that challenge, a small, halftoned (screened) black-and-white reproduction turned up, a yellowed page from an old publication if I remember, apparently recently found among the late artist’s effects. Using only a photocopy of that, a staff artist at Lightstorm did an acrylic version of the full-sized painting for Jim’s approval. 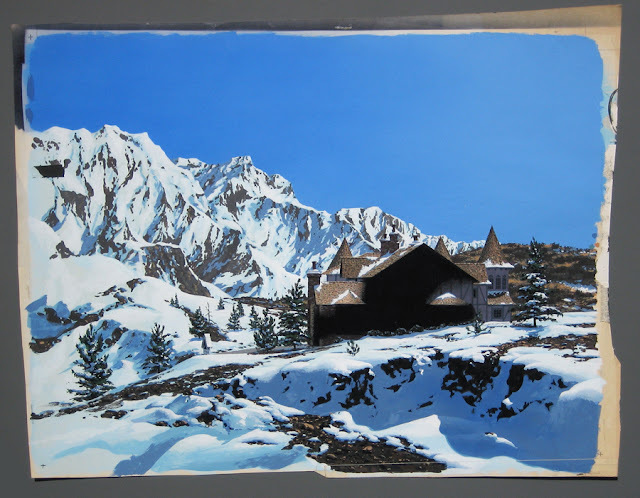 Jim thought it looked unfinished, and he and I could see several missed details and discrepancies between the painting and the old photograph. 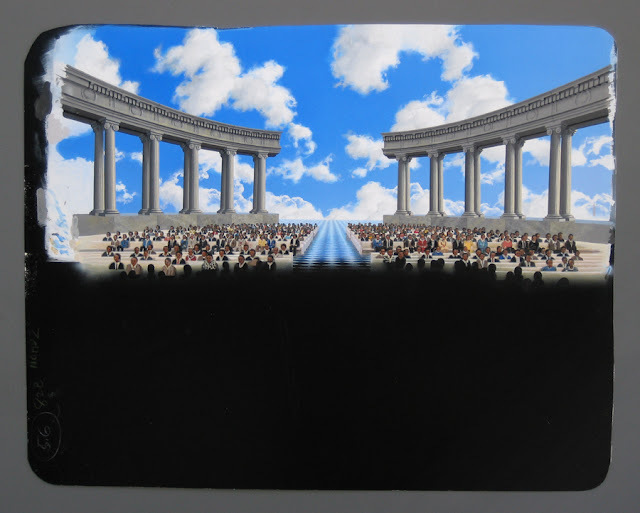 He offered me the challenge of adding more detail, augmenting the sky and water and going over the entire thing to give it a more finished look. I believe it was about then that a color photocopy was received. In a bit of fortuitous luck, Mr. Wilkinson’s son Rodney, who was also an artist, had recently recreated the painting in the style of his father, to be displayed at the Southampton Maritime Museum, using notes his dad kept while working on the original. 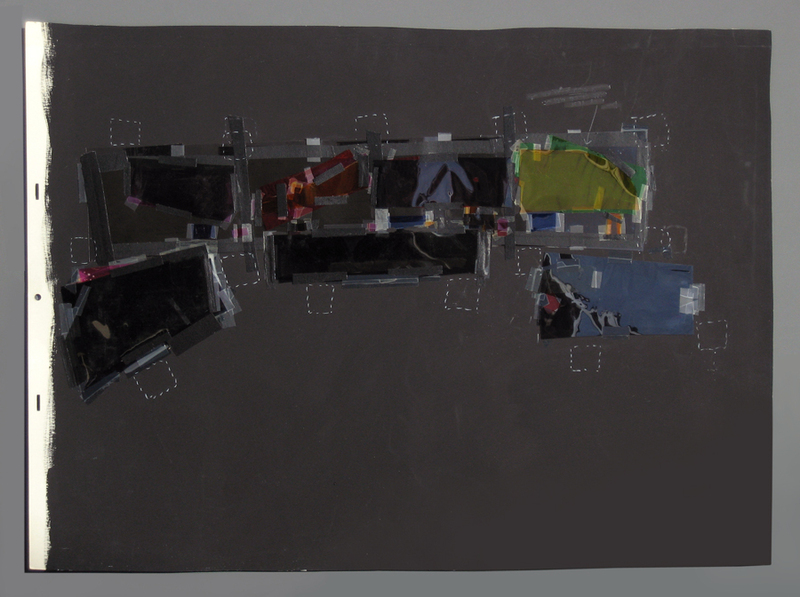 Although I only had the two relatively small photocopies, with this added color reference I went into the prop painting, making numerous changes and improvements to bring it into line with the long-lost original, adding many details, and then gave the surface a thick, glossy, brush-strokey finish that would appear on film to be oils. on the set of the first-class smoking room. But with no close-up photos of either the original or the son’s reproduction, I knew that our prop painting was just a decent approximation, good enough for the camera at a distance but in no way definitive. 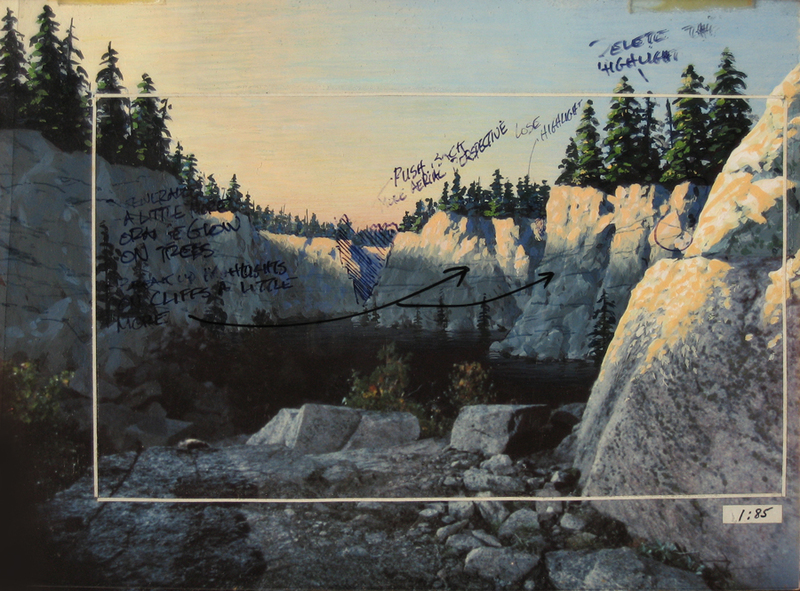 At one point Jim asked me if I wanted the painting after the filming. But it just didn’t meet my exacting standards. I politely declined. 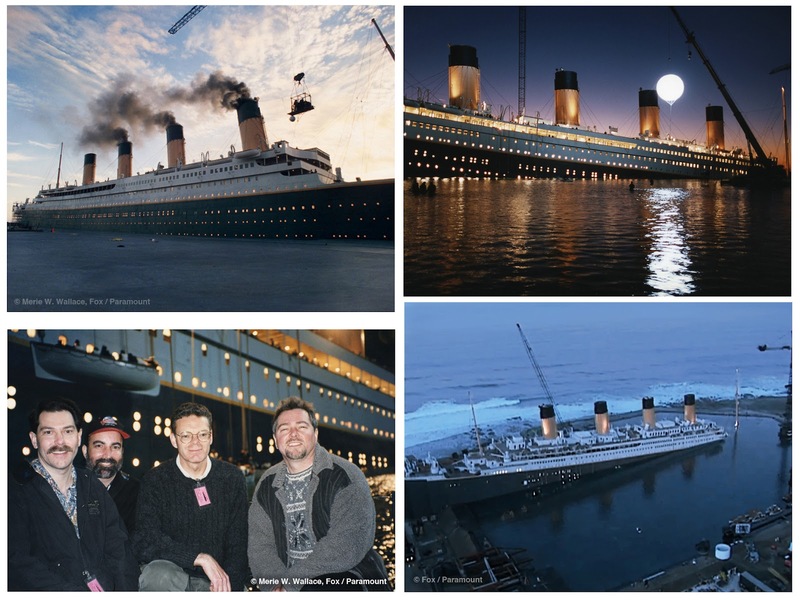 At that early stage of production, still working in Lightstorm’s art department, I simply had no idea what this total TITANIC movie experience would become, what a life-changing, memorable time it would be for me. It gave birth to a longstanding working relationship and friendship with Jim and others that continues to this day, leading to his asking me to come along and dive with him to the wreck on two additional expeditions undertaken to further document the site, and participation with him in television documentaries and books. It’s been an amazing ride, and I owe a lot to him. 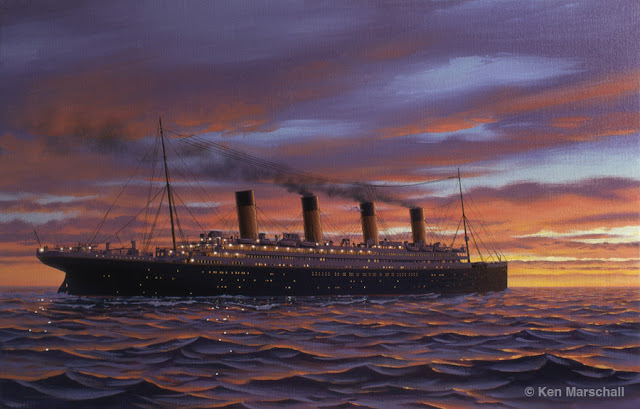 For all those reasons, and that TITANIC quickly became history’s most popular and profitable movie, not to mention tying BEN-HUR for the most Oscar® wins of any film up till that time, I deeply regret not accepting Jim’s offer of that painting when I had the chance. Oh, how I kick myself. 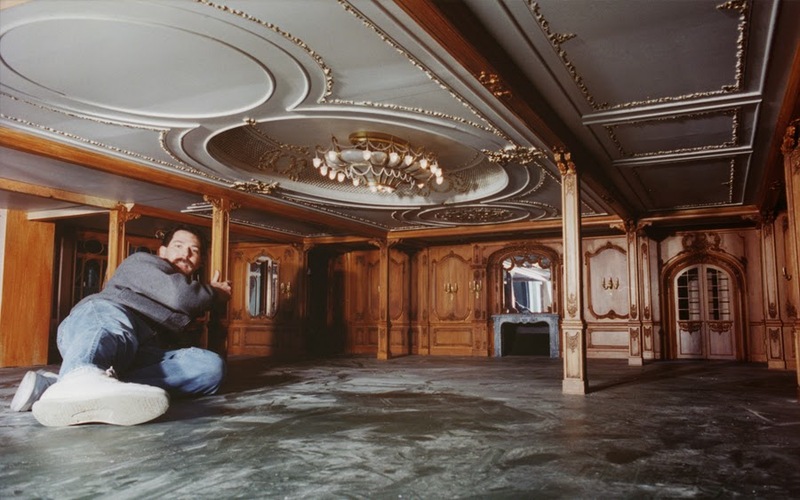 Q: Of course you played a key behind the scenes role not only in the Cameron motion picture but also in some major real life exploration and documentation of the actual wreck itself. 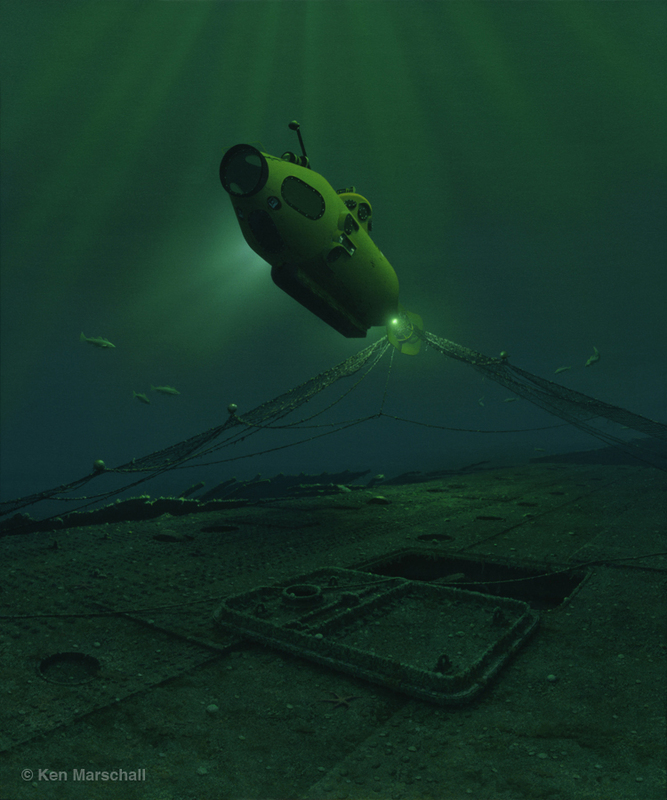 Now as someone not entirely happy in a confined space myself, I’m mortified by the prospect of being in a submersible, as you did on several occasions I believe, let alone diving to the actual Titanic wreck miles down on the Atlantic ocean floor. I simply must hear your first timer impressions and recollections of that event. 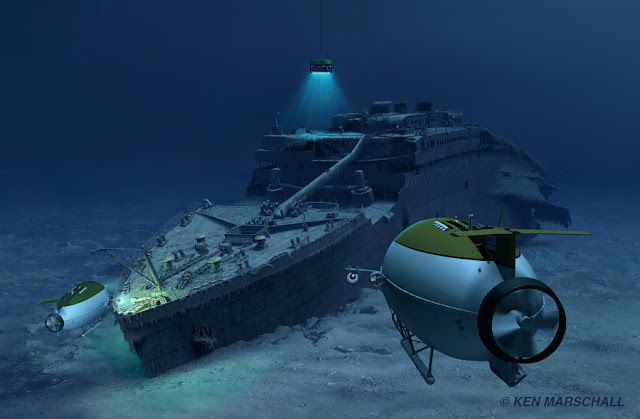 KM: My first dive to Titanic wasn’t my first submarine experience. 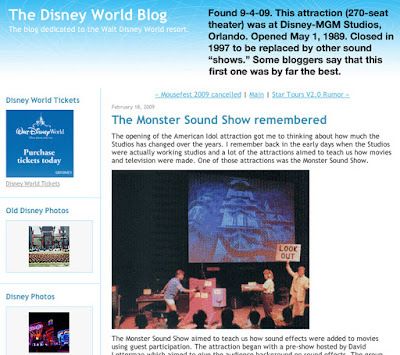 I know this is all off topic, but if your readers want to indulge me, I can give you some background: Aside from the diving bell that they used to have in the late ‘50s at Avalon, on Catalina Island; the submarine rides at Disneyland and Disney World; and a brief climb down into the submersible Alvin in 1987 (high and dry on the deck of a ship), my first real sub dive came in the summer of 1993. After doing many paintings for Bob Ballard’s various books on his discoveries and explorations of Titanic and Bismarck, his publisher had enlisted me to illustrate the book about his next project –– a National Geographic sponsored expedition to document Lusitania which sank in 1915 just off the coast of southern Ireland after being torpedoed by a German submarine. 300 feet below. Nearly 1200 passengers and crew lost their lives. 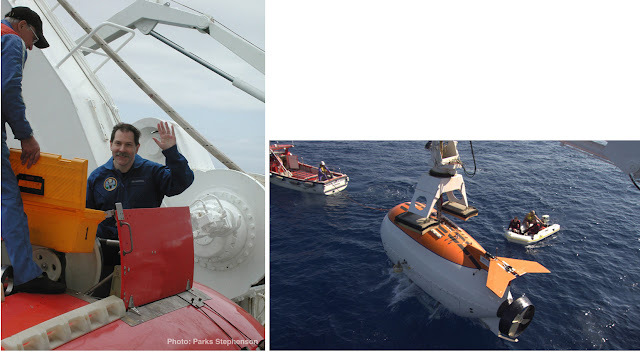 I was to be given a dive to the wreck in the two-man mini-submersible Delta, operated by Delta Oceanographics. The wreck lies at a shallow depth of only 300 feet, so the commute from the support vessel Northern Horizon only took a couple of minutes. The sub was really tiny, like an oversized torpedo, but quite efficient and maneuverable. It had a pressure depth of 1500 feet or so, so we were well within the safe zone with nothing to worry about. But still, I’m with you, Peter, on the claustrophobia thing. I was none too thrilled about crawling into this tube and lying down prone in the front of it, looking out its viewports while the pilot sat on a stool behind me and drove it. But I wasn’t going to pass up the opportunity. The sub had been on over two thousand successful dives in its career. What could happen? In the unlikely event that the single propeller got tangled in debris or something, the pilot could actually detach the tail from inside and we would pop back up to the surface. But there had never been an incident that called for that. As it happened, Lusitania historian Eric Sauder and I had traveled to Ireland together to participate in this expedition, and as we didn’t know if we’d get more than the one dive (anything could happen preventing Eric from going later), rather than try to pick who should go –– the artist or the historian –– on what might be our only opportunity, we decided that it would be ideal if we could dive together and be able to communicate with each other, in effect covering twice the ground. The Delta guys said that two adult observers had never tried to squeeze into it at once, only kids had. So it would be a first. It was determined that by taking out a little ballast the added weight was no problem to lowering, hoisting or navigation, so off we went. I think the scariest part was lowering myself through that narrow hatch at the top and committing myself to this highly claustrophobic experience. That’s when the feeling of being trapped, the fear of drowning, hit me. But it’s like roller coasters: Watching them flying around precariously, if it were the first coaster ever made and the first time you’d ever seen one, you’d never get on the thing. 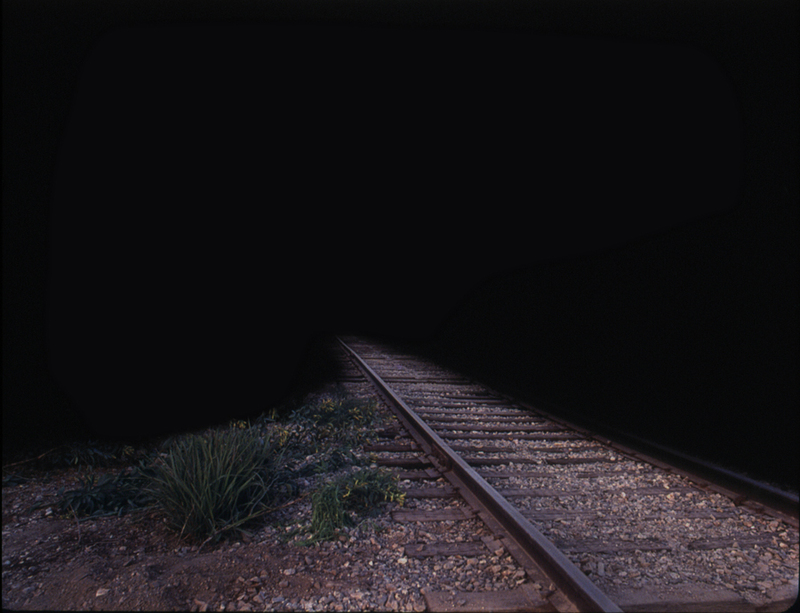 It’s obviously far too dangerous; it’ll fly off the tracks at any moment. But when you know that a coaster has been operating safely for years and that not a single soul has ever been injured, it makes a huge psychological difference. You recognize the potential for danger, but you also know it hasn’t happened. What are the odds that I, the five millionth rider on this particular coaster, will die on this thing, right now? all around. 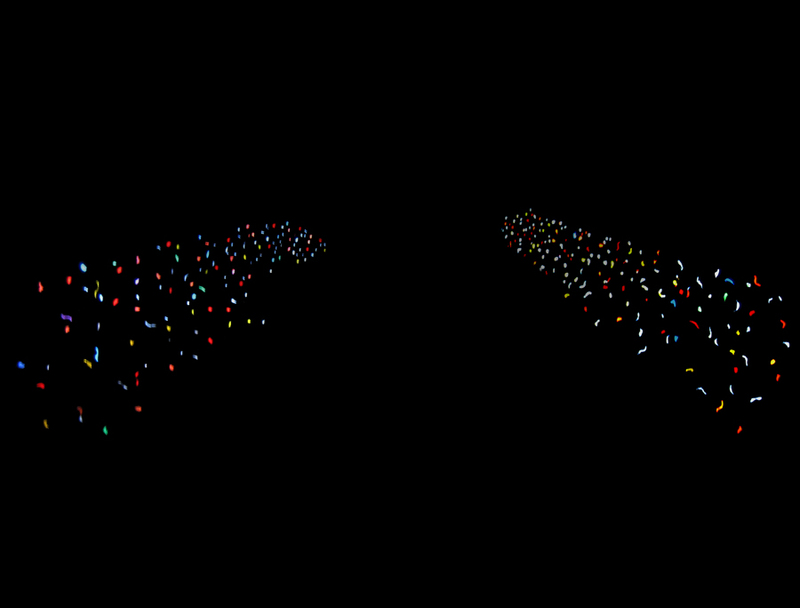 Observers lie down in the space forward of that. It was indeed cramped inside, as expected, and I could basically only look out the front and one side port while Eric could only do the opposite, but we managed. Within two minutes we had reached the gravelly bottom and were heading toward the wreck. The deep, deep intense green of the water outside will always remain vivid in my memory. It wasn’t very clear; with the sub’s exterior lights on we could see maybe 25 feet or so, at most. We asked our pilot, Chris Ijames, if he could turn off the lights so I could get a sense of the ambient lighting for my upcoming artwork. 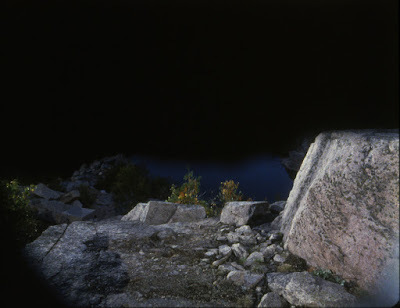 Interestingly, we could see a lot farther with the lights off, a supremely eerie scene, but it was so dim and “hazy” that the lights were definitely an advantage for close exploring and examination. I could go on for pages describing the experience, but this isn’t the forum. I’ll cut to the chase: After maybe 45 minutes probing Lusitania’s stern area, we were moving forward over the collapsed port side of the hull when the propeller sucked up a fine Nylon strand of an old fishing line, one of many caught on the wreck, which quickly wound up into a heavier entanglement. The propeller seized. Chris tried reversing the prop, everything he could think of, to no avail. We were trapped. After all the dives this sub had done without incident, it had finally happened. Sure enough, on our dive. Long story short, after much discussion with the surface via underwater acoustic “radio,” Chris did what he was trained to do, crawled back in the small hull and somehow released the whole rudder/prop section without flooding the sub itself, freeing us to float back up to the surface at a significantly bow-down angle. 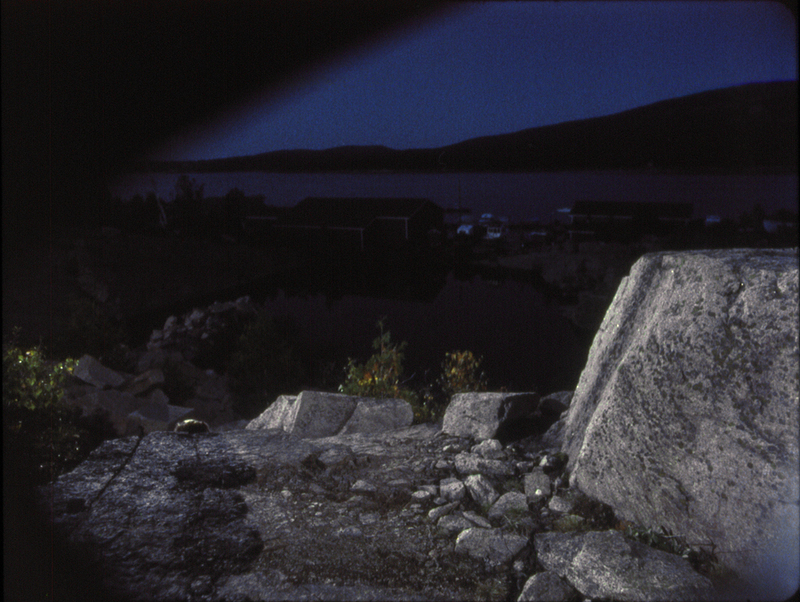 collapsed port hull, an open doorway just below, on August 4, 1993. Q: Were you ever frightened during any of this. KM: Amazingly enough, not really. Our pilot’s reassuring calmness and good humor made it seem oddly routine, something we just had to wait out while, we imagined, discussions no doubt ensued on the surface about how National Geographic could get this on video for the show, and so on. If you let yourself go there, sure, you could work yourself up into a terror. There were times when I just had to keep my mind on the mission, not think about where I was. It was more disappointing than anything. “Just our luck,” we said to ourselves. “What are the odds? 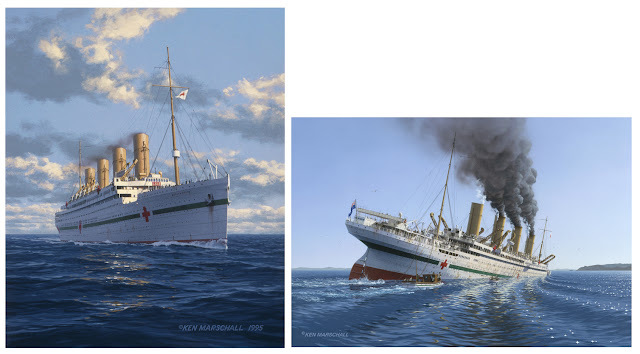 Our one dive to Lusitania, and we had barely begun.” Fortunately we were given a second chance a few days later and were able to explore and study more of the wreck, this time without incident, thankfully. mini-sub Delta examines the port side of Lusitania’s bow in 1993. Roy Disney and his wife came out and visited our ship during that expedition. I don’t remember if they were vacationing in Ireland at the time or what, but somebody knew somebody, and they were invited aboard for an afternoon while Ballard gave them the tour and they watched the goings-on. I was stunned by Disney’s resemblance to his famous uncle. 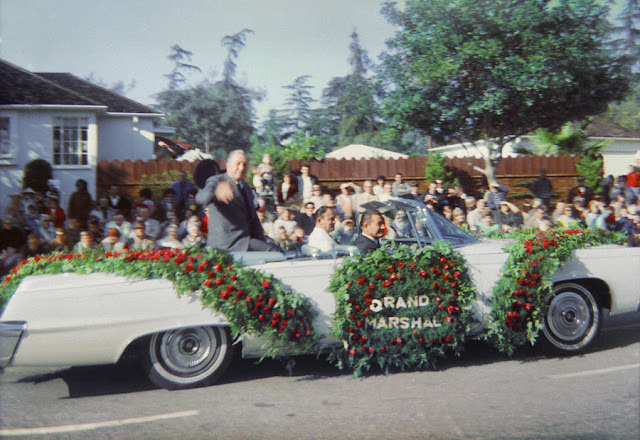 I never met Walt, but at age 15 I did take a decent picture of him as he, the Grand Marshal of the 1966 Rose Parade, was slowly driven by. He turned and looked right in my direction as I snapped the pic with my Brownie Starmite camera. 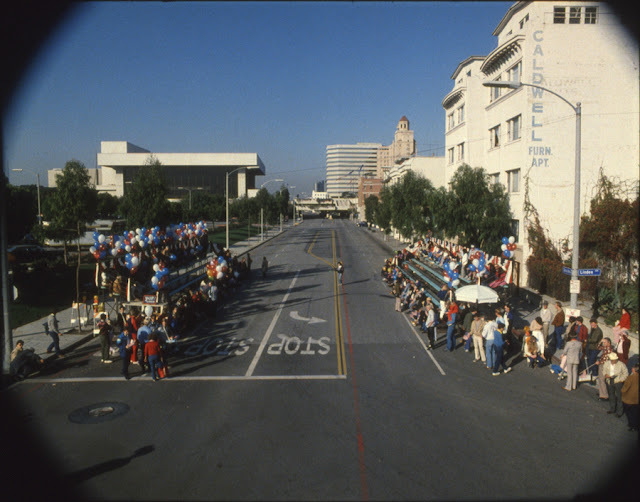 Tournament of Roses in Pasadena, California, taken New Year’s Day 1966. What a thrill it was to see him in person! 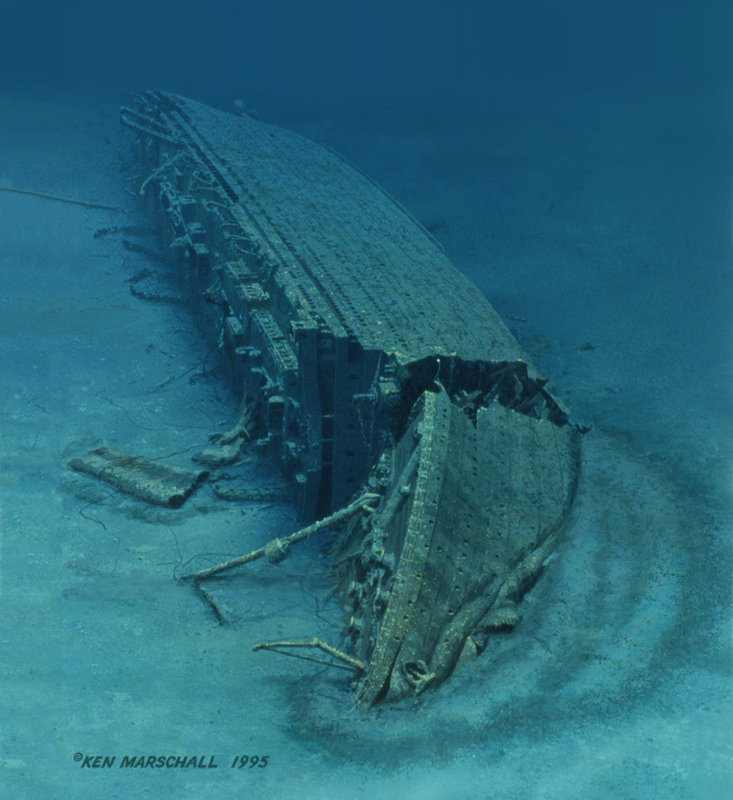 Two years later Ballard again had me along, this time on an expedition to explore and document the wreck of Britannic, the second of Titanic’s two sisters, which had struck a German mine in the Aegean Sea in 1916 while serving as a hospital ship. Fortunately no patients were aboard as the vessel was on its way to pick up injured in Moúdros, on the island of Limnos. I would be doing paintings of the ship for an upcoming book called Lost Liners. 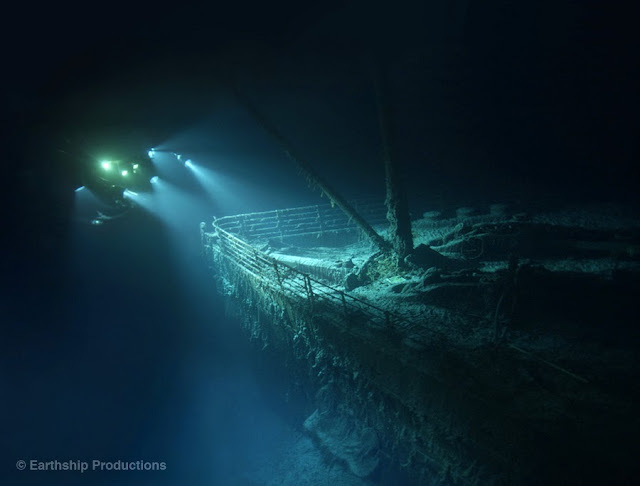 The wreck, the largest passenger ship on the sea floor in the world, lies on its starboard side in 400 feet of beautifully clear water and is in remarkably intact condition. On this trip the U.S. Navy’s nuclear research sub NR-1 was used, and I went down one day for a good study session. 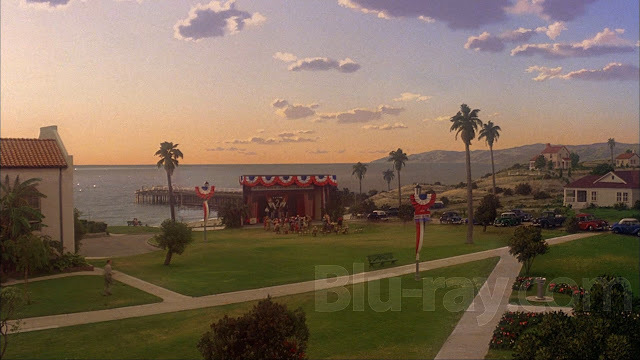 Unlike at Lusitania where the water had a deep, saturated green color, here it was turquoise blue and much brighter. The visibility was so good that when the sub had only begun to descend I could already begin to make out the fuzzy shape of the dark hulk far below against the snow white sand. The U.S. Navy nuclear research sub NR-1. largest passenger shipwreck in the world. NR-1 is the largest sub I’ve experienced, with a 12-man crew, as I recall. So in this case I suffered little or no anxiety, with a team of very experienced Navy crew and several officers at the ready in case of any emergency. The small viewing area is up forward under the control center, or bridge, accessible through a hatch in the floor. I spent many hours down in that little observation area, sketching and photographing. While touring around we found all four of the ship’s funnels scattered about, all but one some distance from the hull, each having been witnessed to topple over and break away as the ship rolled during the last stage of the sinking. The funnels were in amazing condition, each in one piece, with their ladders and whistles still attached, although a bit flattened. The dive was to be maybe six hours or so, but the weather deteriorated up top, got rough, and it was decided to remain underwater throughout the night. I was fed along with the crew, in shifts, at a small table, and given a “rack” to sleep in. The next morning the wind and waves were just as bad, and in the end we stayed down throughout that second day, as well. By the time we surfaced we had been hovering over and around Britannic for just under 48 hours straight. 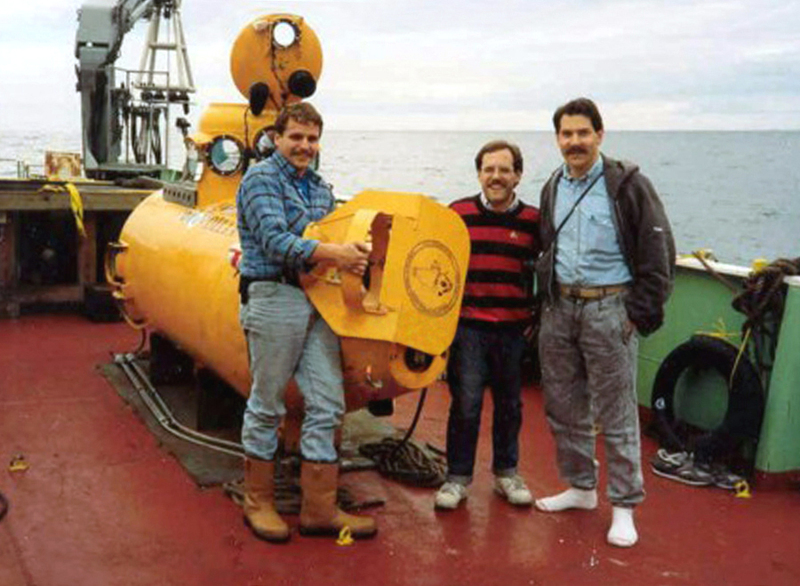 A lot of study and documentation, including detailed side-scan sonar mapping, were accomplished during that time. And then, Titanic. In 2000 I was invited along on a segment of what would be the last major Titanic artifact recovery effort, using the twin Russian submersibles Mir-1 and Mir-2 and the support/research ship Akademik Mstislav Keldysh. I was there with notebooks full of archival photographs to assist with identification of objects and so forth, not really knowing or expecting that I might actually dive. But one day I was told I could go the next day if I wanted. I knew I couldn’t pass up the once-in-a-lifetime opportunity, and I immediately accepted. After all, I was a seasoned submariner now, right? But a low-level panic gripped me. This wouldn’t be a relatively shallow 300 or 400 feet. This was 2 1/2 miles, straight down. You can imagine the thoughts racing in my head: I’d be irreversibly trapped in a six-foot sphere with two other adults for as long as 10 hours or more (sometimes a lot more)… descending to the bottom of the Atlantic… and once there, the risk exists that at any time we could snag on some debris and be stuck… or worse, that while next to the towering hull some large debris might fall away from the rusting hulk and pin us to the bottom… that because of the immense outside pressure a sudden leak no more than a pinhole in size would shoot water into the sphere with such force that it could, they said, cut a man in two…not to mention worry about how stress or excitement might affect my bladder and bowels, with no toilet available. And there’s just the one pilot. What if he has a stroke or a heart attack? Neither of us passengers had a clue of how to get us safely back to the surface or even how to use the UQC communication equipment (underwater acoustic radio). It was a dizzying array of fears and hesitation. But I had to do it. I’d never live it down if I didn’t. I wasn’t as nervous about it as some, though. I was told that a few had gotten as far as the hatch on top of the sub and changed their minds, and I know people who say they wouldn’t do it for a million dollars. 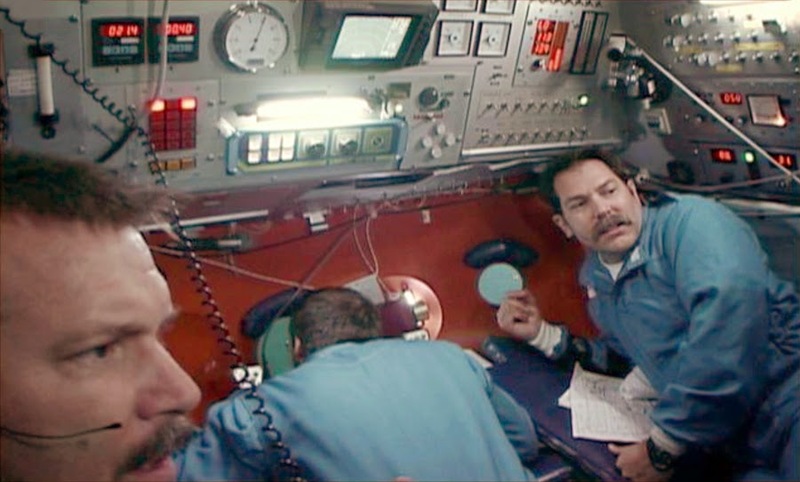 On August 5, 2000, after donning the Nomex fireproof diving suit issued to all Mir divers, I climbed down into Mir-1. It wasn’t nearly as scary as I’d feared. The other passenger and I were given a very brief tutorial on how to operate the UQC if the pilot became disabled, and that’s all we really needed to know. 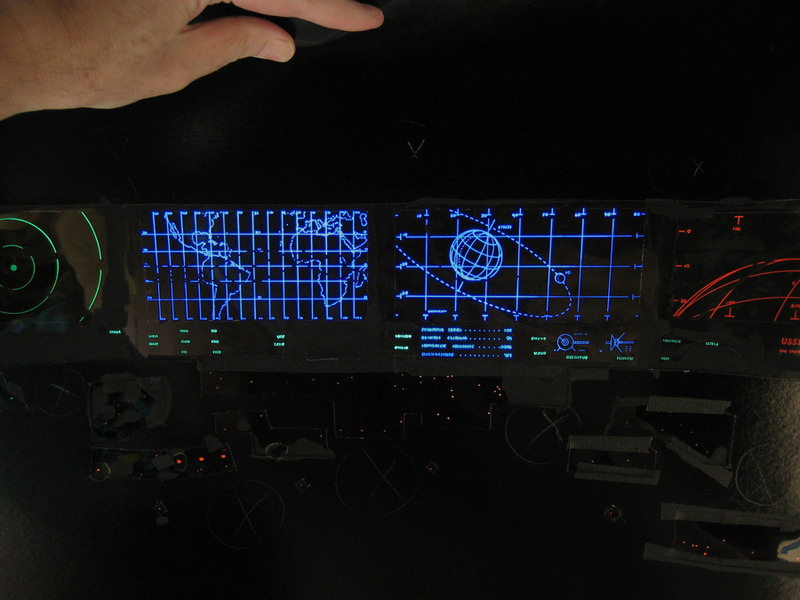 Turns out it was always on and connected, and all we had to do was press the mic switch and we’d be heard by the other sub, where someone would always be able to speak English and could relay to us what to do via the other pilot. The two Mirs always dived together for safety reasons, and that was reassuring. The nickel-steel sphere is something like 6.5 feet (about 2 meters) in interior diameter, but there are all kinds of instruments, video recorders, communication equipment, an air scrubber, etc., fixed to the sides and impinging on our elbow, leg and head room, and our various camera bags were hung from above. Despite this, I became quickly used to the confined space and felt more or less comfortable. It is what it is, and you just can’t worry about it. The Russian pilots are extremely experienced with their subs, and watching them operate with such confidence is comforting. expeditions their orange tops were repainted red. It takes about two hours forty minutes to free-fall, at about 1 mph, to the bottom where Titanic rests at about 12,500 feet. The air pressure inside the sphere remains at “one atmosphere” throughout the dive, the same as it on the surface when the hatch is closed, so there are no potential ear aches to worry about. I’d been told it gets very cold inside (the outside water temperature is just above freezing at depth, with only the heat of our bodies and the various electrical equipment to heat the space), and I don’t like to be cold, but I never, in all my Titanic dives, really felt too uncomfortable. I don’t recall ever needing more than a light sweatshirt. There are dark blue padded vinyl mats for the two observers to lie on on either side of the pilot who sits in the center, and each observer has a viewport about four or five inches in diameter, while the pilot’s port is about eight inches. Q: It sounds like the existence of a gunner in the dome on the underbelly of one of those B52’s – prone, uncomfortable and vulnerable. KM: There were many distractions outside that took my mind away from any discomfort. A real highlight of descending through the pitch-black water column and ascending again later is passing through the region of bioluminescent creatures. With the outside lights turned off to conserve battery power, it was astonishing, simply awesome, to peer out of the port while we slowly moved vertically through the water, our turbulence disturbing thousands of myriad living things and causing them to light up in their varying hues of greenish yellow, lavender and white. There were individual bursts and rippling, undulating chains of light. Sometimes I could see the bluish glow from a larger creature far off in the black, mysterious distance. It was creepy and utterly wondrous at the same time, the ultimate “immersive” experience, absolutely magical and almost as interesting as exploring the wreck and debris field itself. It proved to be a fascinating study in how different we humans are, as well. While I was glued to my viewport oohhing and ahhing over the glowing wonders drifting past outside, one fellow observer across from me on a later dive (his first) couldn’t have been less interested in the spectacle on display outside our sub. Go figure. 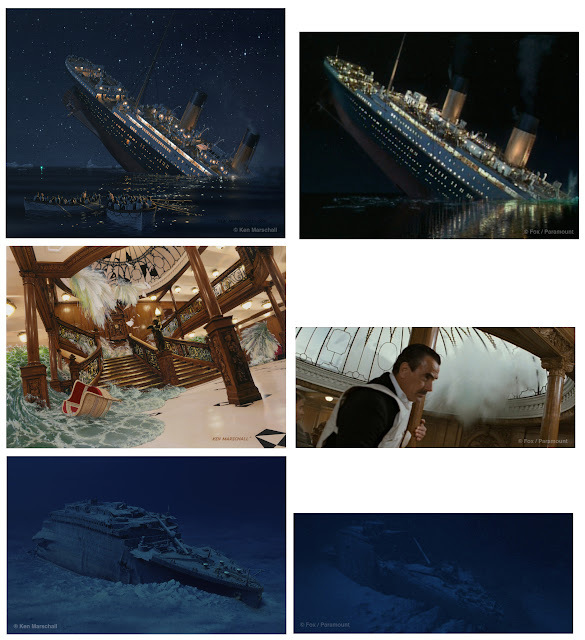 My reaction to first seeing Titanic with my own eyes was rather anticlimactic, I’m afraid. I had already studied thousands of photos and dozens of hours of video of the wreck while illustrating books about Bob Ballard’s 1985 discovery and exploration in ’86, so I knew almost every nook and cranny of the thing by then. If anything, it was like meeting an old friend. Not too many surprises. I will say that I was struck by the sheer size of the ship, seeing it with my own eyes. It seemed absolutely huge. Another thing that stuck with me was the ghostly stillness down there, in the utter blackness, enlivened only rarely by a slow-moving rattail fish or occasionally by other creatures, from shrimps to small jellyfish, and on the sediment were starfish (called “brittle stars”) and large, purplish slug-like things. There is weather down there. Big time. 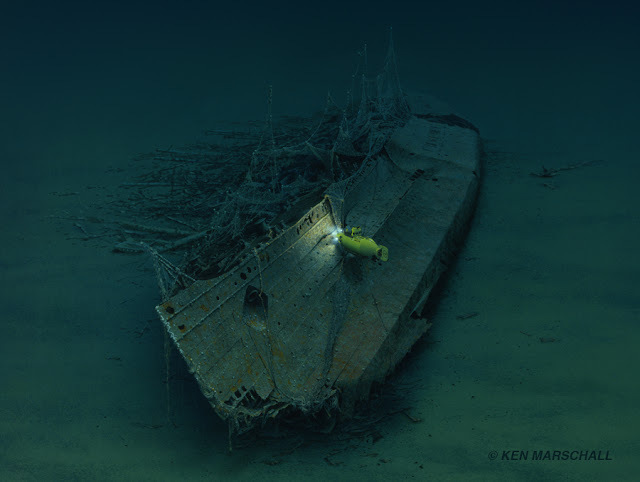 On one dive there might be virtually no current, and you could see 80 feet or more with the sub’s lights. The very next day there could be a significant current running, with light fluffy debris “blowing” along the sediment like tumbleweeds in the desert, and you could hardly see 20 feet. The rivet counter that I am, my most excited moments moving around the wreck were when I spotted small structural details I hadn’t known about before. 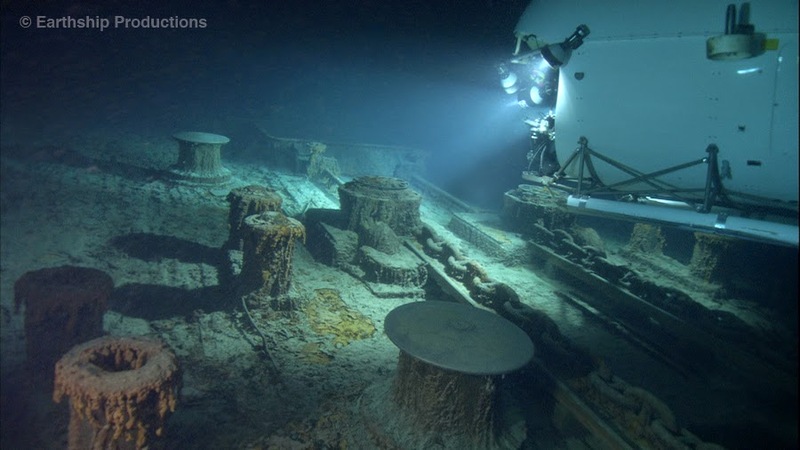 I remember almost having my breath taken away when I noticed, hidden behind a cargo crane in the forward well deck, a bulkhead lamp fixture with an intact wire guard over it. It was the first time, to my knowledge, that any living Titanic historian or model builder had known of this fixture, tucked away behind the large crane base and virtually never visible in archival photographs. I felt I was the first to see this lamp since the night of April 15, 1912, and know what it was, and I was awestruck. After decades of studying the ship and her every detail, this was a private, personal and meaningful moment. It felt like Titanic was speaking to me. “Hello, Ken. You didn’t know this about me, did you?” Q: I can imagine the thrill of the moment and that sudden sharp intake of breath you must have experienced. KM: The air in the sphere is kept clean and fresh by the scrubber, the filters for which have to be changed once or twice during a dive. The UQC volume has to be kept on in case the other sub might communicate with us, and its constant static noise can become mind numbing if you don’t use earplugs. 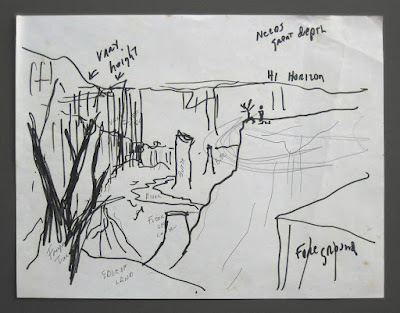 Late in the dive, usually shortly before ascent, we take a break in our work, rest on the wreck or the mud bottom for a while, and the pilot opens a compartment under his perch and brings out edibles, a thermos with a hot beverage and a large chocolate bar for each of us. Thankfully my bowel concerns have always been unwarranted, but I had no shame when it came to peeing. While one fellow diver, Ralph White, light-heartedly boasted about his “mind over bladder,” I didn’t want to be uncomfortable and soon learned that, hey, it ain’t so bad to just turn your back and use the large plastic pee bottle. That’s what it’s there for. On that first dive in 2000 selecting and recovering artifacts from the vast debris field, I was busy, on a mission, observing intently and trying to recognize interesting or important objects among the tangled wreckage for potential recovery. 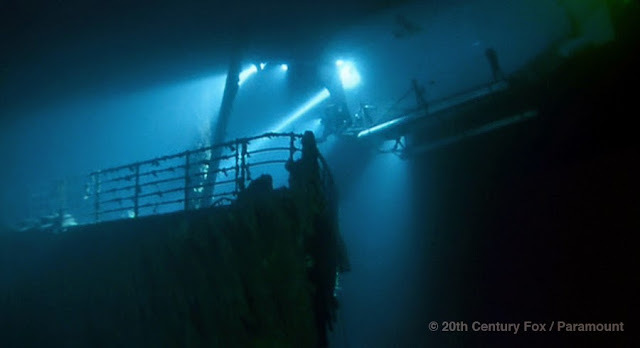 For my five subsequent Titanic dives on Jim Cameron’s explorations in 2001 and 2005, also using Keldysh and the faithful Mirs, my job was equally busy but a different task –– to direct the pilot in my sub to light shots for Jim who was in the other sub or to otherwise scout out areas for investigation or photography. So, in GHOSTS OF THE ABYSS or LAST MYSTERIES OF THE TITANIC, when you see what appears to be sunlight streaming in through windows or portholes as Jim explores the ghostly interior with one of his ROVs (remotely operated vehicles), or “bots,” that’s usually me out there, guiding the pilot so our sub could act as a lighting source for Jim. and Genya and I inside on the way to the bottom, both taken in ‘01. for the children’s book Titanic: Ghosts of the Abyss. 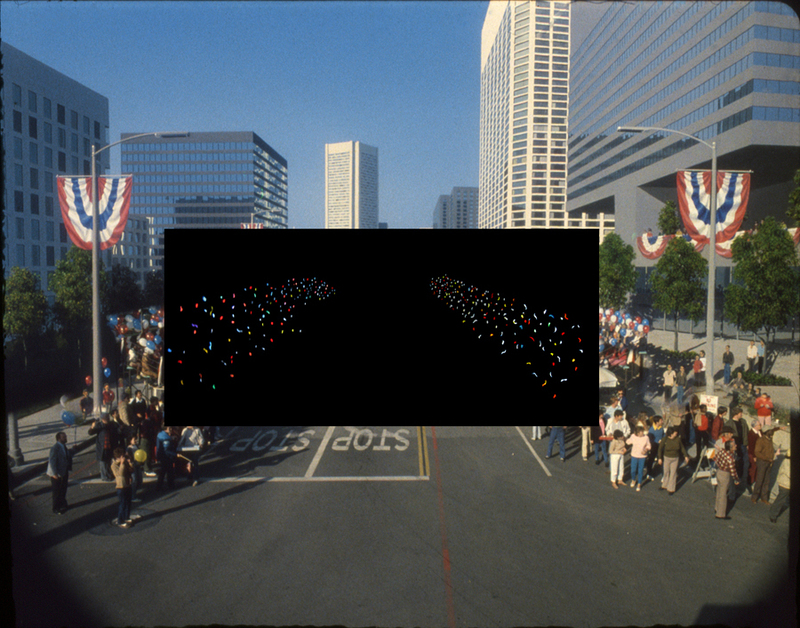 was shot in standard definition with one of Jim’s several compact bots. for use in the book Ghosts of the Abyss, published in 2003. The most worrisome time of a dive for me eventually became my concern over the sea condition when we surfaced in the evening or at night. 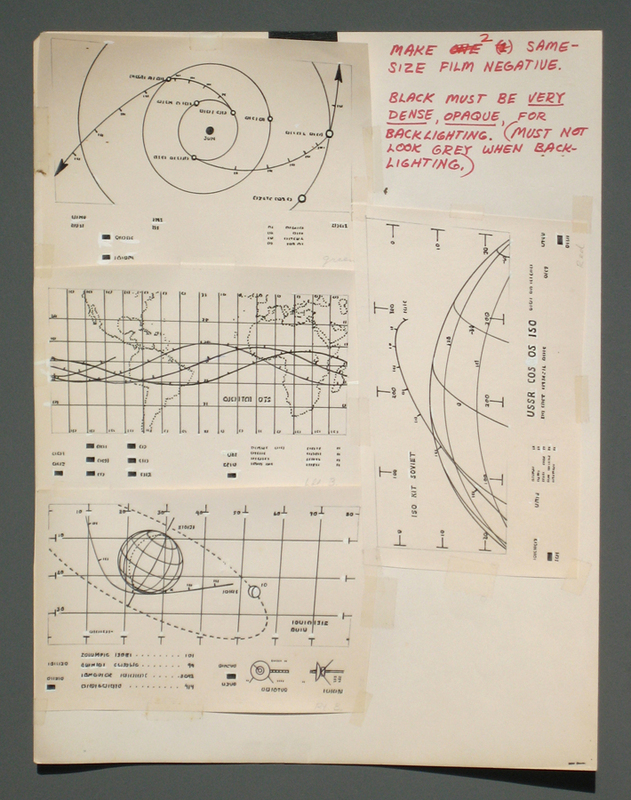 It always seemed to be rougher during recoveries than during morning launches. I don’t like to be seasick (I’d rather break an arm, seriously), so the thought of being in this small tub and tossing and rolling around incessantly for up to half an hour or more before being lifted back onto the deck of Keldysh was very unsettling. Fortunately I never was sick. I just lay down on my mat, on my back, and closed my eyes, breathed deeply and imagined I was on some fun ride at Disneyland, and tried to relax. So there you are, a few of my “impressions and recollections” of diving in submarines to famous wrecks. Q: So Ken, your life has clearly been a series of exciting, satisfying and memorable events and opportunities where it seems to me that all of your professional wishes had been granted… and then some. What more could one ask for. KM: For two decades, when asked what I did for a living, I would proudly say, “I’m a matte artist in the film industry.” It’s taken many years to really come to grips with the fact that I can’t say that anymore. 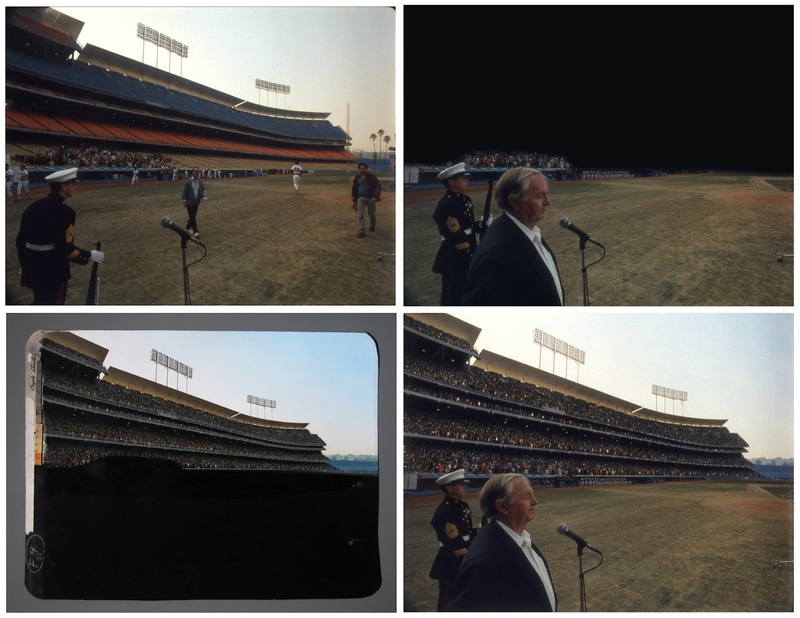 My matte-painting days are over. It’s history. I’m not a person who likes change. I adapt slowly. Too slowly, probably, to master the vastly complex machinations of 21st century digital effects. The learning curve would be a bit too steep, I suspect, for an older guy like me, and the pace of work and demands to which digital artists are subjected are suited to others with far higher energy levels than I possess. 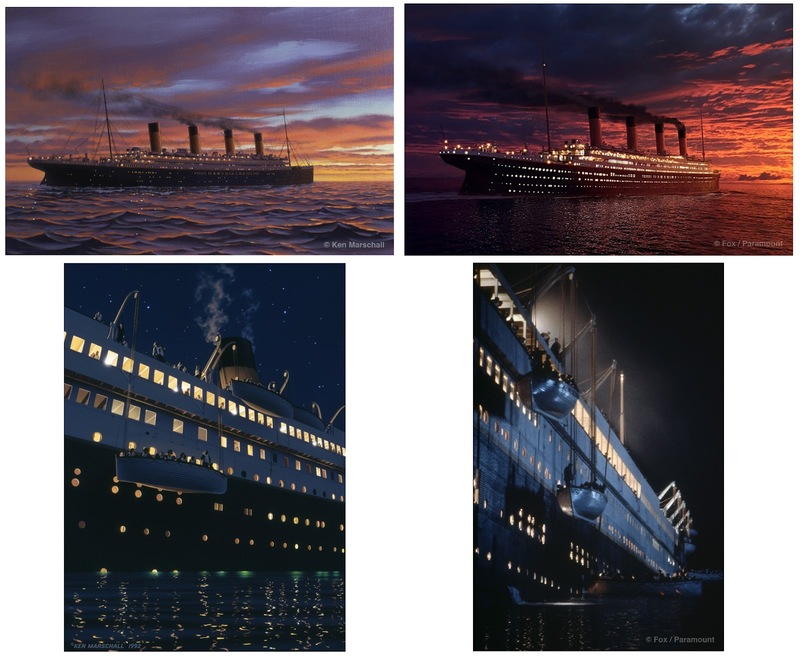 So I have returned to my roots, as it were, painting maritime commissions for clients, advising on various Titanic-related projects and doing occasional Photoshop work. I’ve thought of teaching art, as well, passing my experience and knowledge along to younger generations. Bruce has been encouraging in that regard. Who knows... maybe that will be the next chapter in my life. Magenta faded 35mm of some 30 years in storage clip now restored. 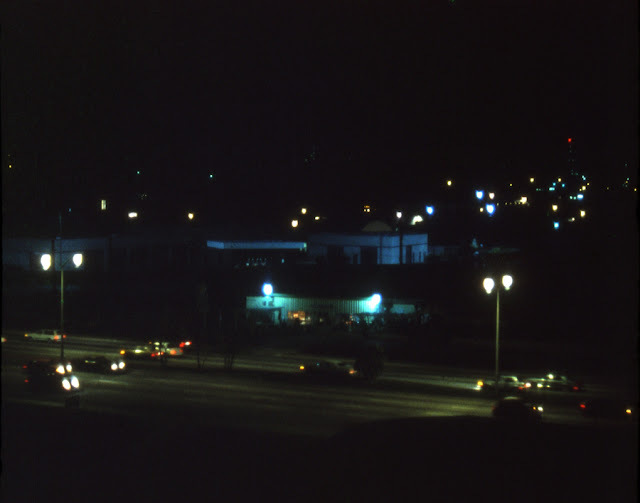 Assembling these old, faded film test clips and scanning, color-correcting (I’m stunned by how magenta some of them have become, despite being kept in complete darkness), cleaning and otherwise restoring the imagery for posting in this blog has been a cathartic journey. 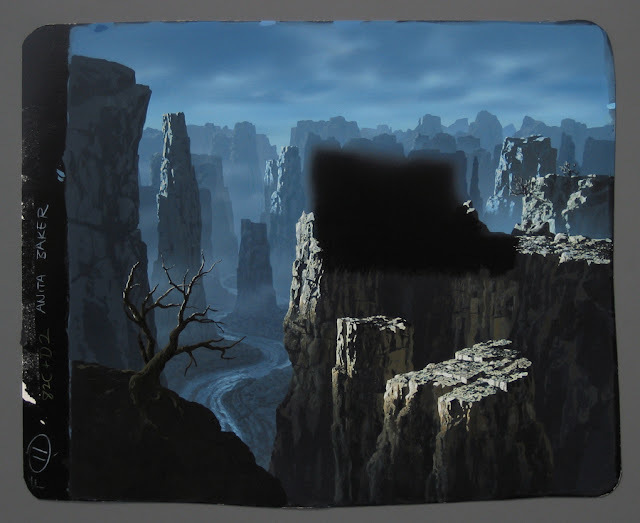 Our traditional original-negative matte-painting work just slowly died, killed off by digital, leaving me with a sense of loss. I've missed it. And this blog project, something that’s taken over six months to pull together, has allowed me to finally tie it all up with a bow. It’s closure. And I needed that. Although Bruce and I kept our heads low and never sought the limelight, when Mark Cotta Vaz and Craig Barron published their seminal work The Invisible Art, it caught us completely by surprise. We had no idea someone was putting together such a massive and detailed volume, flattering matte artists known and unknown, and it stung that we were never approached and our decades of work never mentioned. We had kept such a low profile, I guess, that the authors didn’t even know of us. 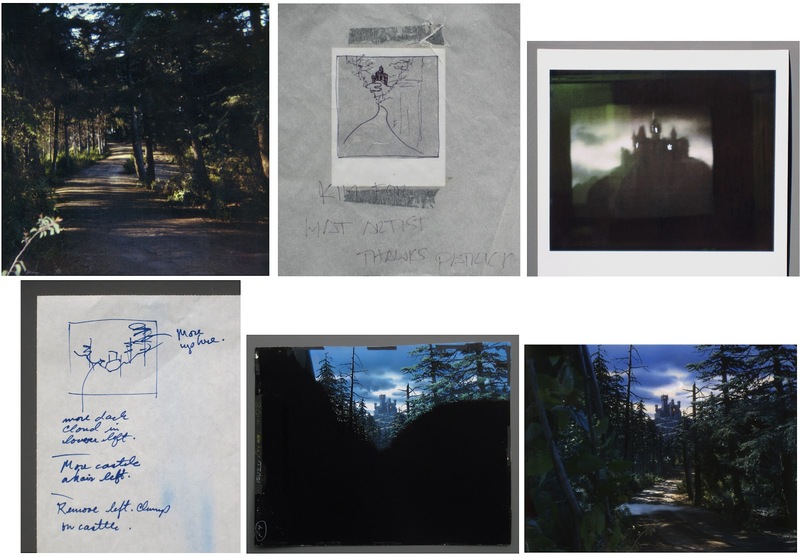 So, to finally have some of our efforts recognized here in this endlessly fascinating blog, interviewed along with so many other legendary and stellar names in the world of matte art, is an honor and, frankly, a healing experience for us. On behalf of Bruce and myself, thank you, Peter, for contacting us and offering us this opportunity. 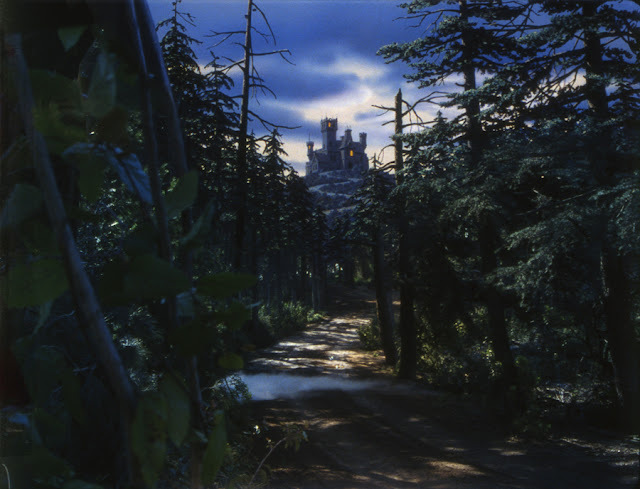 And thank you for all your work in continuing to bring the traditional art of matte painting to light and keeping the flame burning. Both of Bruce Block’s books are available at Amazon.com.